009T: Поезд 009Т Алма-Ата – Астана идёт между станциями Бель и Кулакшино. На встречном пути копошатся ремонтники контактной сети на дрезине АДМ-466 чуйской ЭЧ-22. 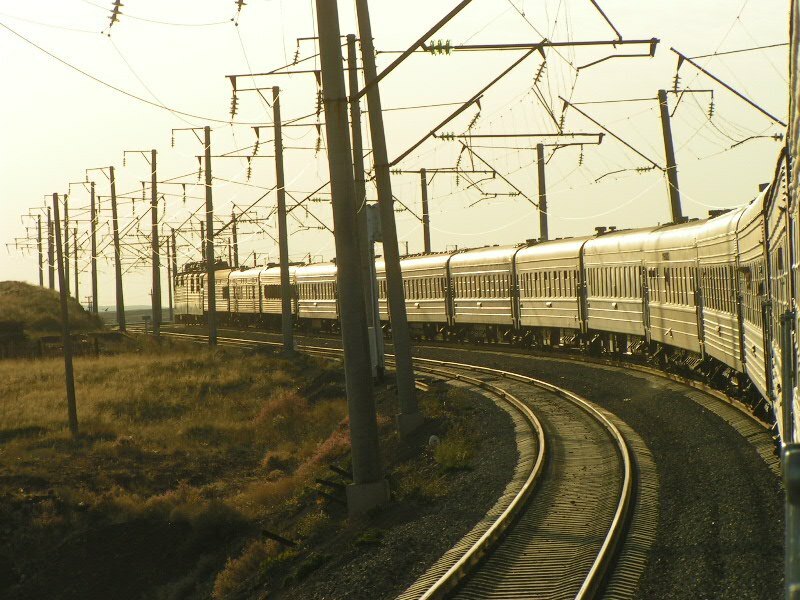 В голове - ВЛ80с-2565 ТЧ Чу. 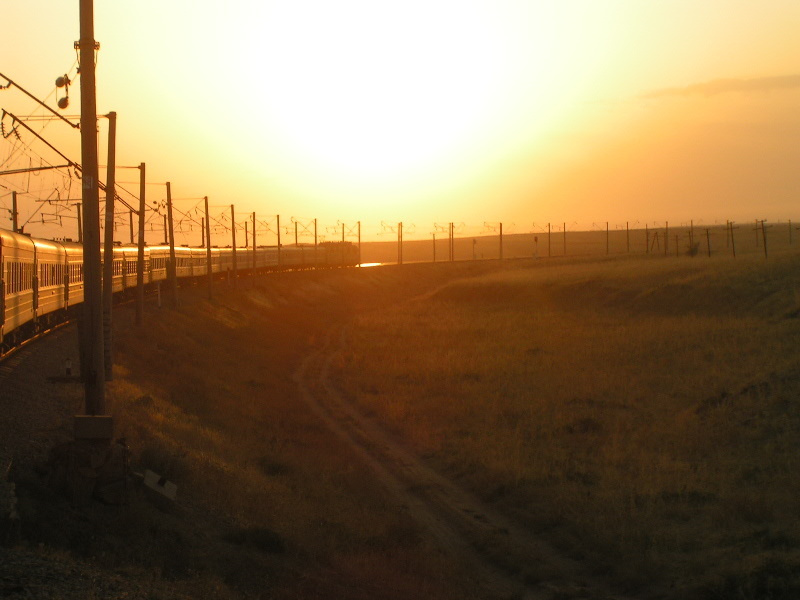 Две красноватые полоски вдали, вдоль заборов снегозадержания – распускающиеся степные тюльпаны... "Турксиб", Жамбылская область, 24 апреля 2005. 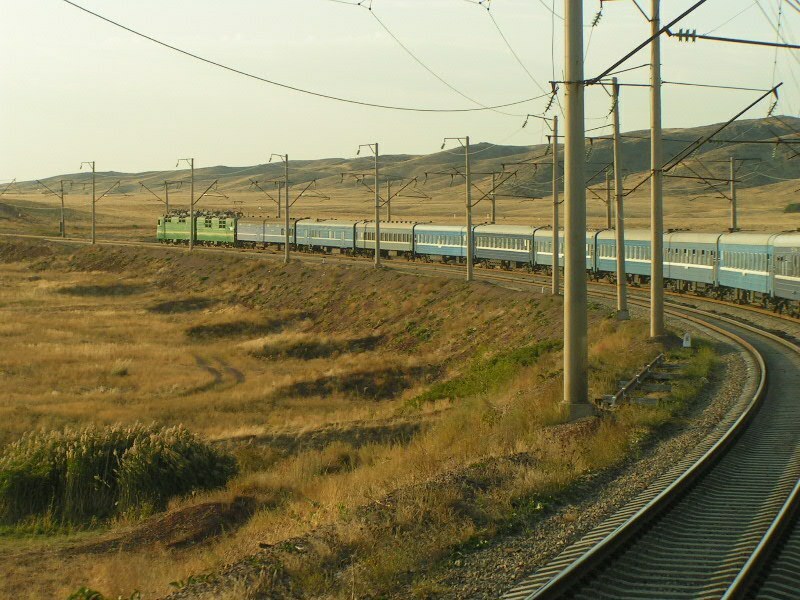 / The fast train 009Т Alma-Ata - Аstana goes between stations Bel and Kulakshino. On a counter way work the repairmen of a owerhead wire on track machine ADM-466 from Chu depot. 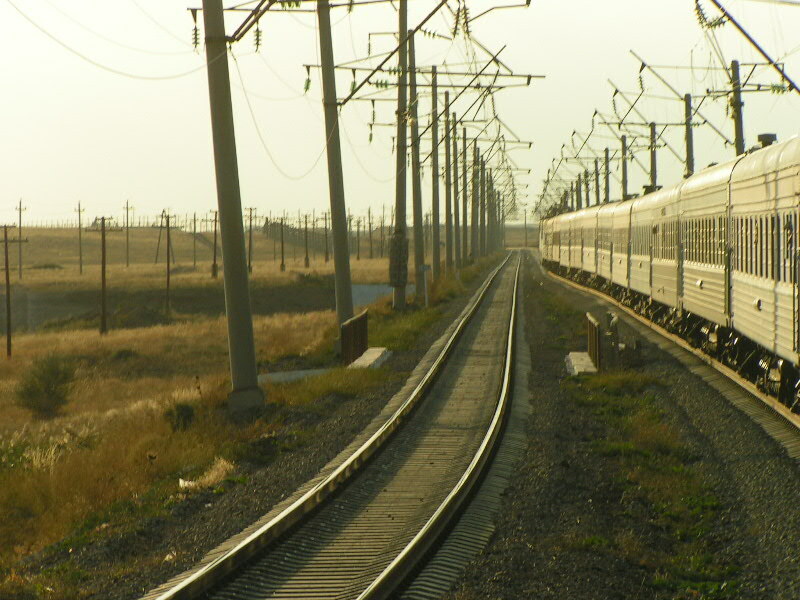 In a head - electric locomotive VL80s-2565 from Chu depot. 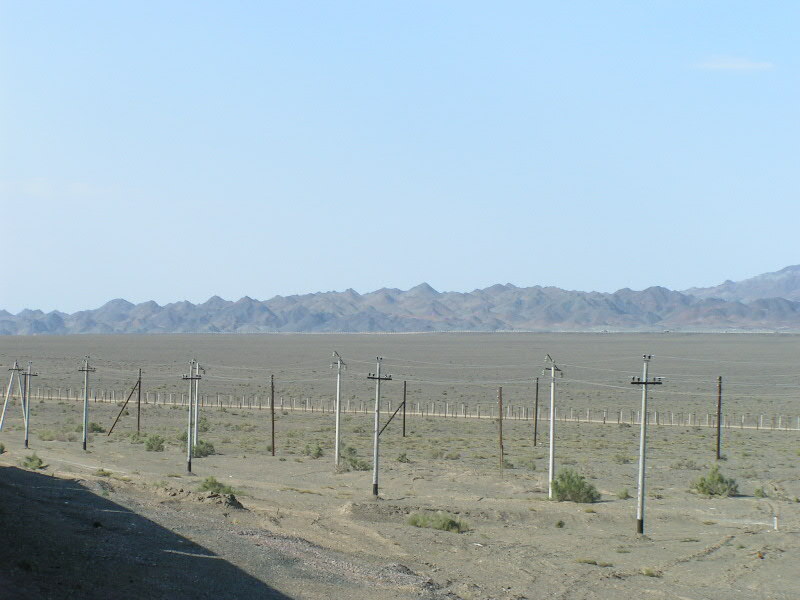 Two reddish strips in the distance, along fences retention of snow on fields - dismissed steppe tulips... "Turksib", Dzhambul region, Kazakhstan, April 24 2005. 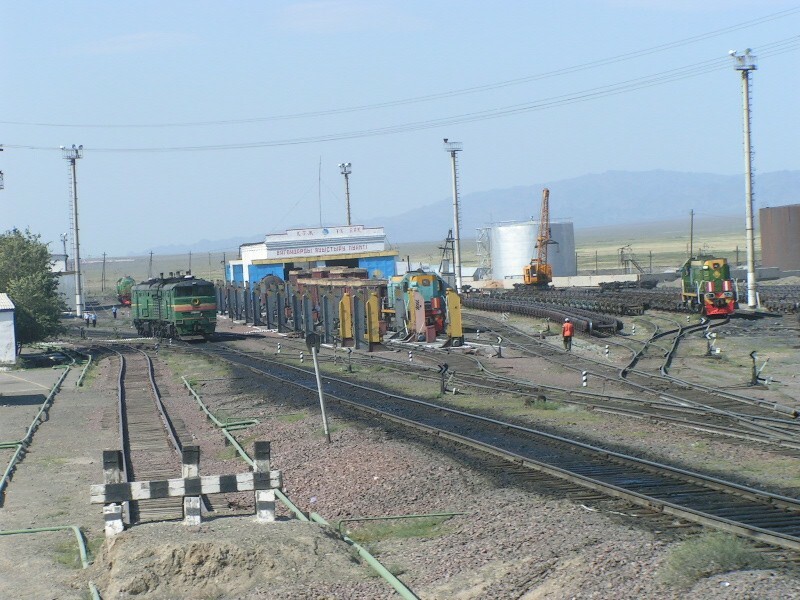 Regauging facility at Druzhba/Dostyk (Kazakhstan) on the line from Urumchi (China). 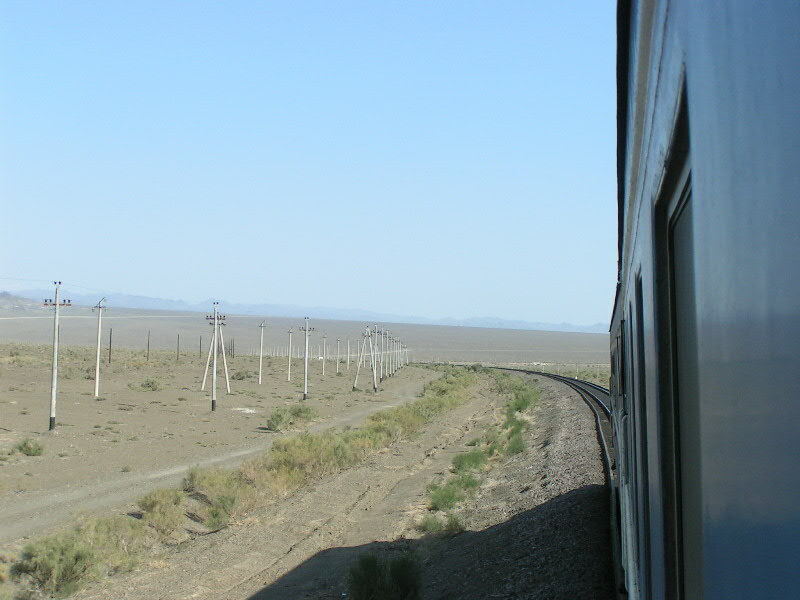 View from train 13 (Urumchi - Alma-Ata) after leaving Kazakh border station Druzhba (Dostyk). 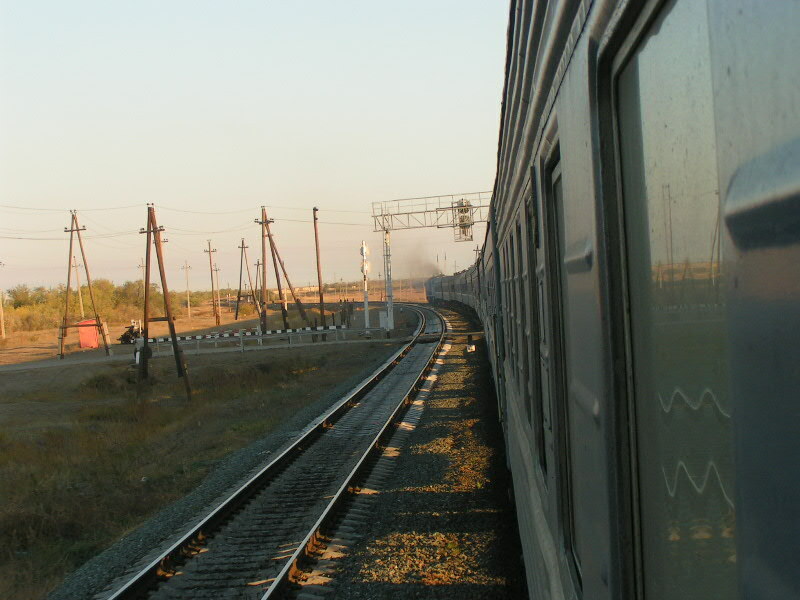 Train 13 (Urumchi - Alma-Ata) somewhere between Druzhba/Dostyk and Jalanashkol. 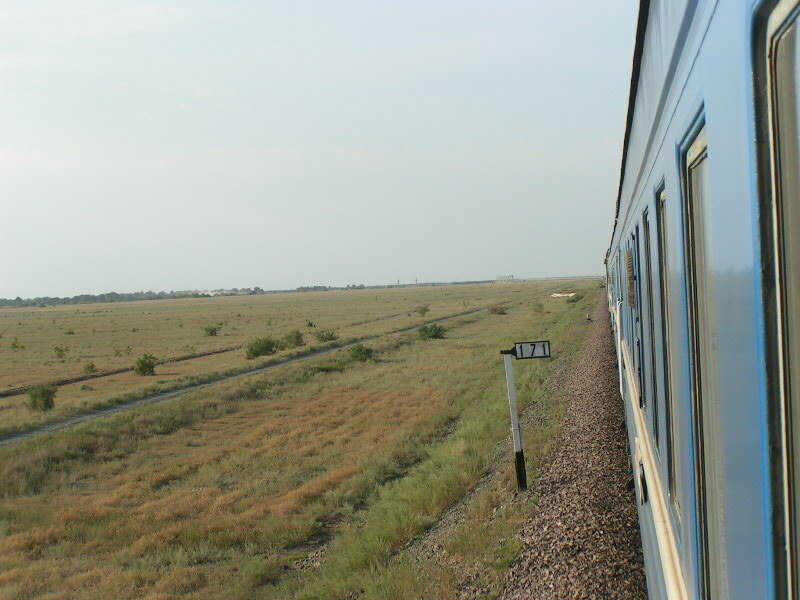 Train 13 (Urumchi - Alma-Ata) somewhere between Jalanashkol and Koktuma. 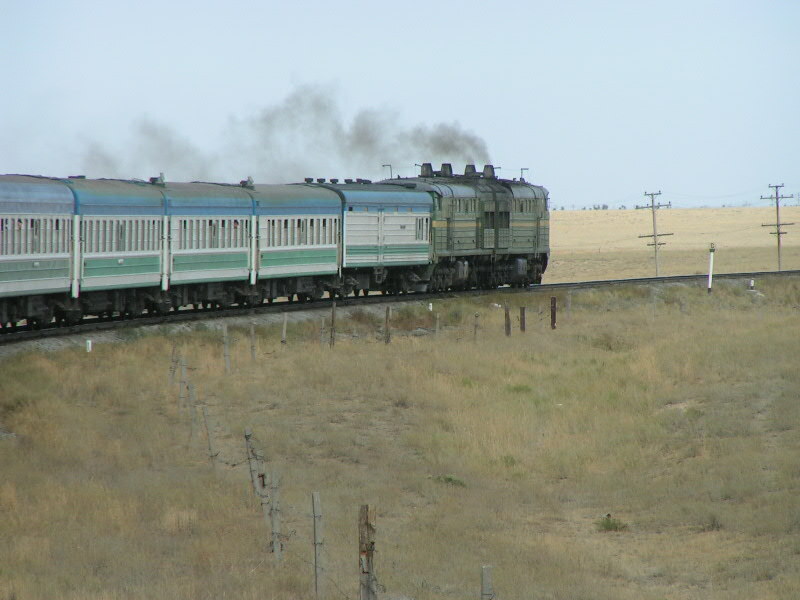 Train 13 (Urumchi - Alma-Ata) passing lake Alakol between Koktuma and Beskol. 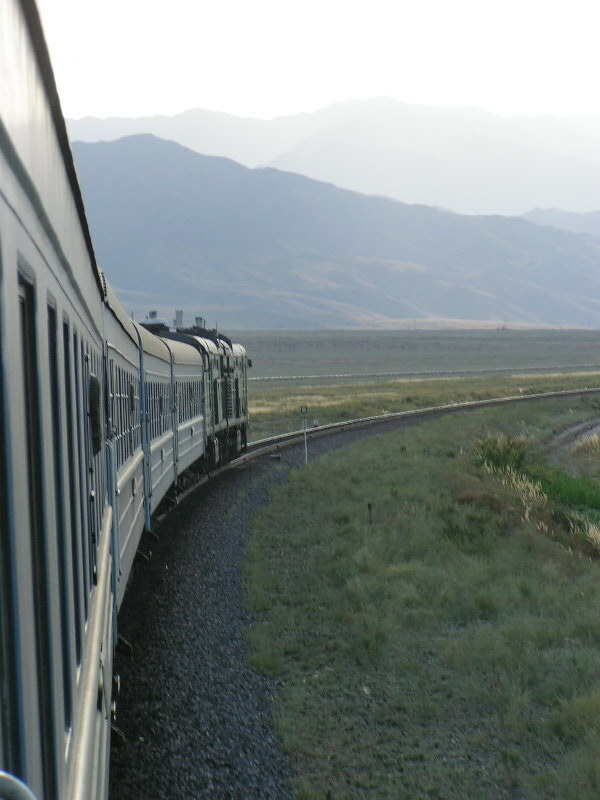 Train 13 (Urumchi - Alma-Ata) somewhere between Koktuma and Beskol. 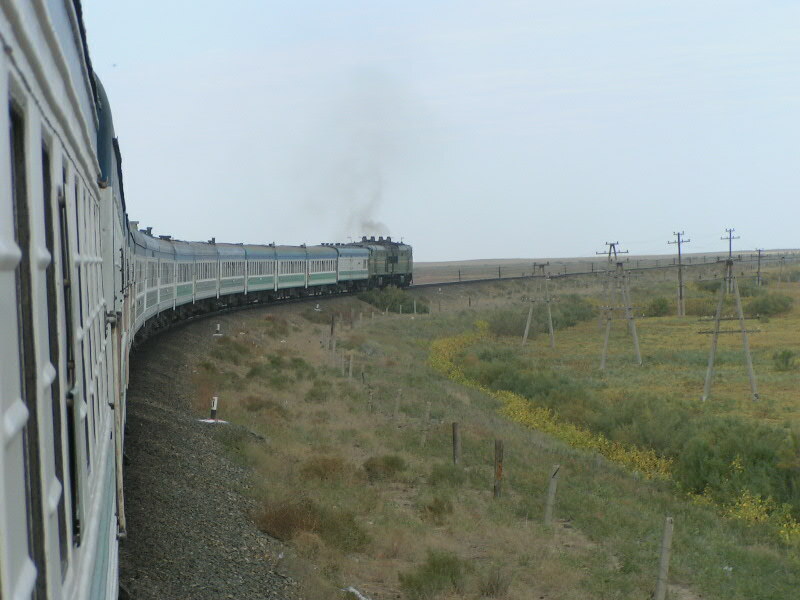 Train 13 (Urumchi - Alma-Ata) passing small bridge somewhere between Koktuma and Beskol, already prepared for double tracking. 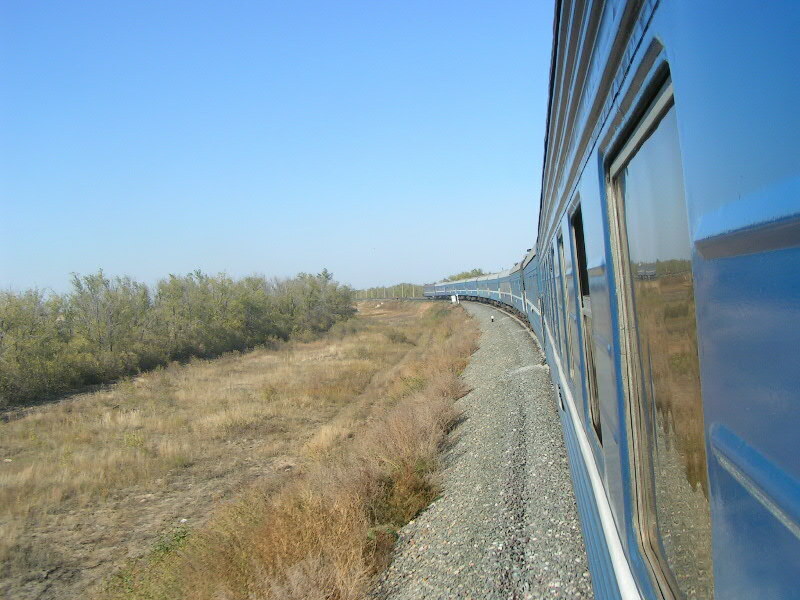 View from train 13 (Urumchi - Alma-Ata) somewhere between Koktuma and Beskol. 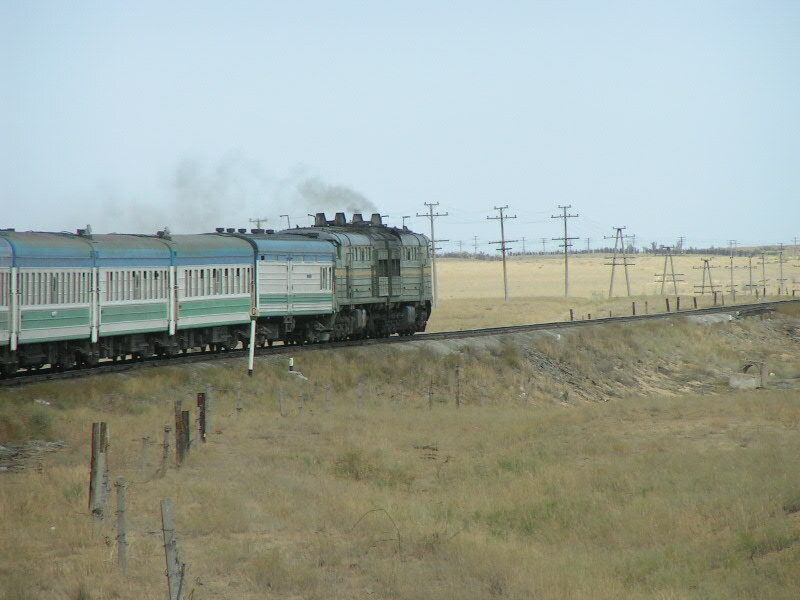 Train 13 (Urumchi - Alma-Ata) at km 171 between Koktuma and Beskol. 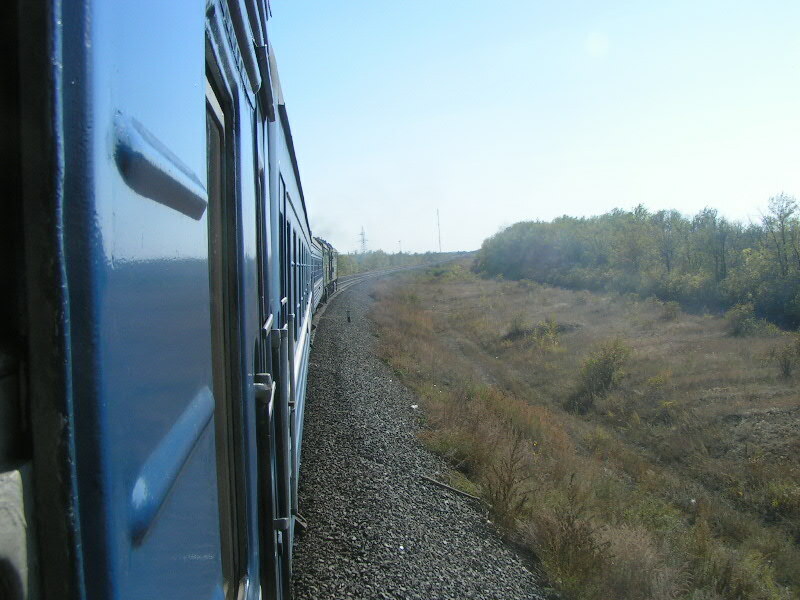 View from last car of train 13 (Urumchi - Alma-Ata) somewhere between Beskol and Aktogaj. 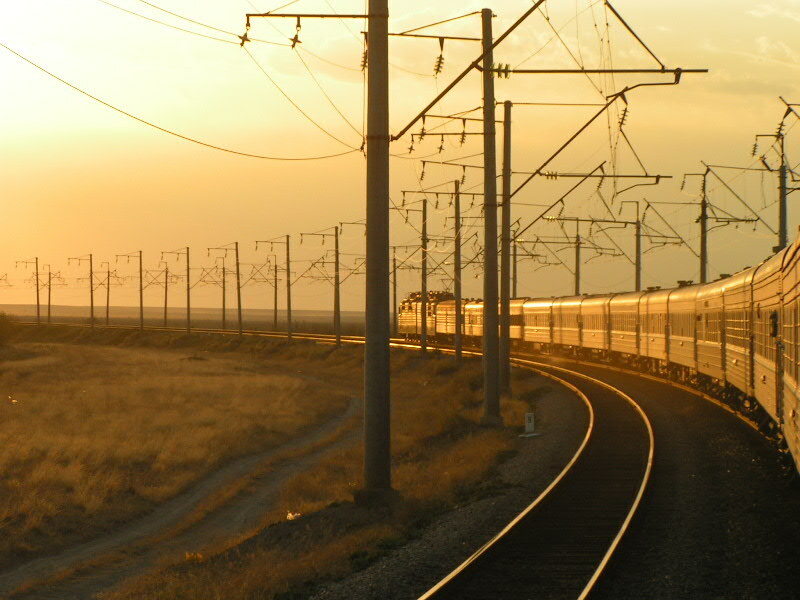 Sunset seen from train 13 (Urumchi - Alma-Ata) somewhere between Beskol and Aktogaj. 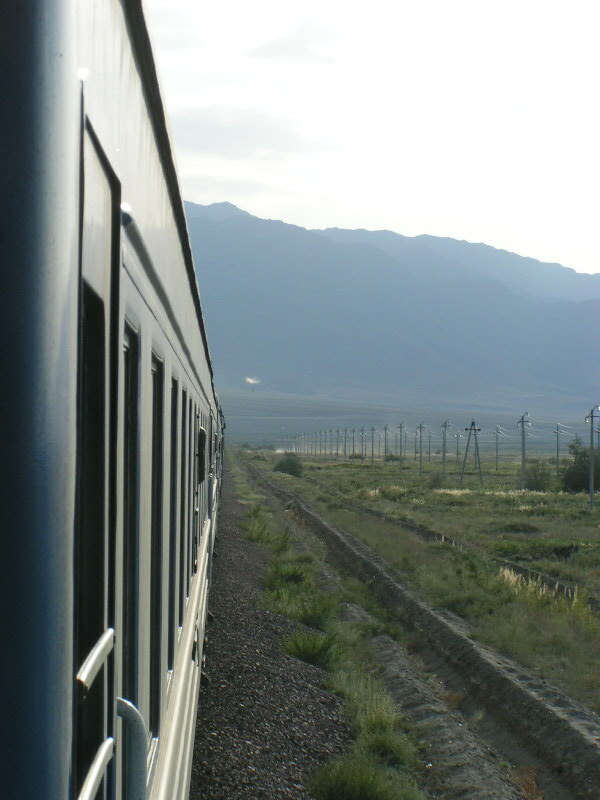 Train 13 from Urumchi between Alma-Ata 1 and Alma-Ata 2 - the Tienshan-mountains can be seen in the background. 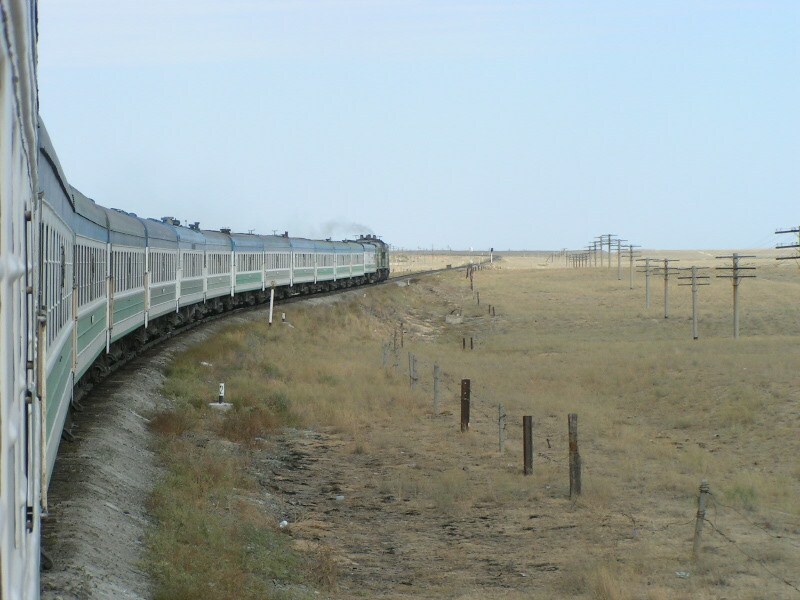 Train 23KH (Alma-Ata 1 - Aktjubinsk) between Alma-Ata 1 and Otar. 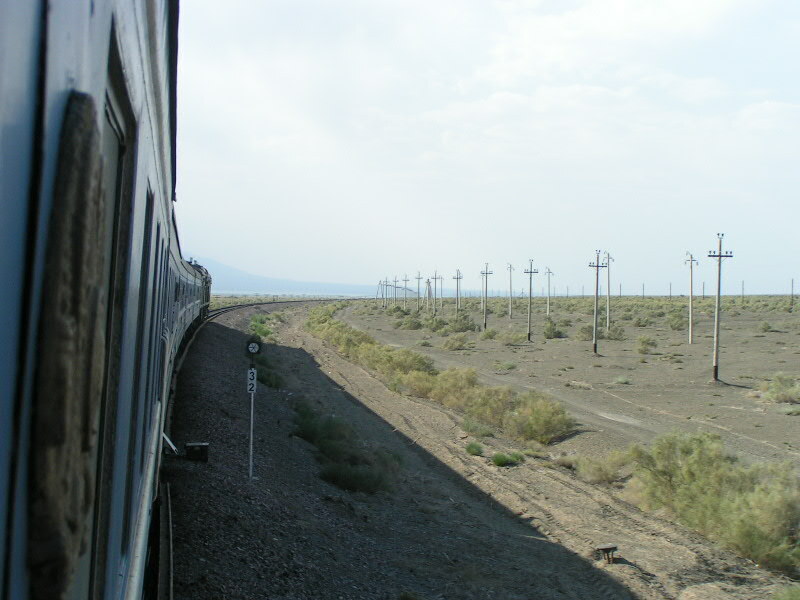 Train 23KH (Alma-Ata 1 - Aktjubinsk) in the Kazakh steppe between Otar and Chu. 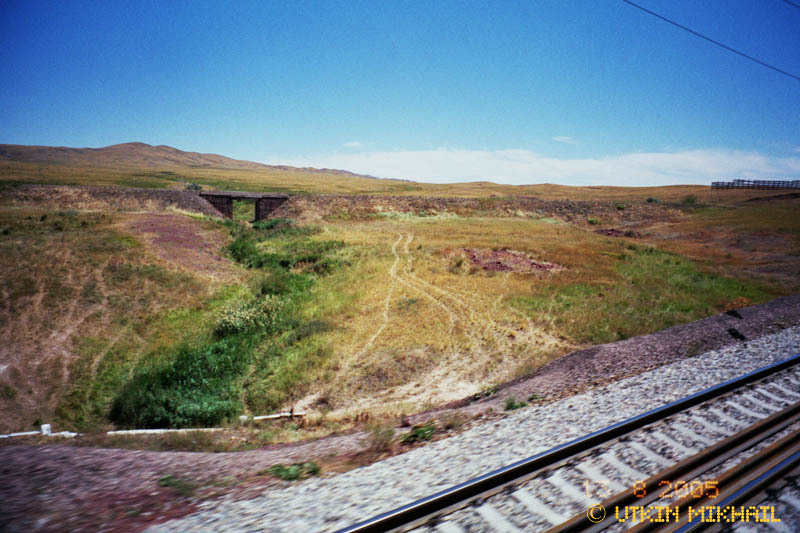 View from train 23KH (Alma-Ata 1 - Aktjubinsk) in the Kazakh steppe between Otar and Chu. 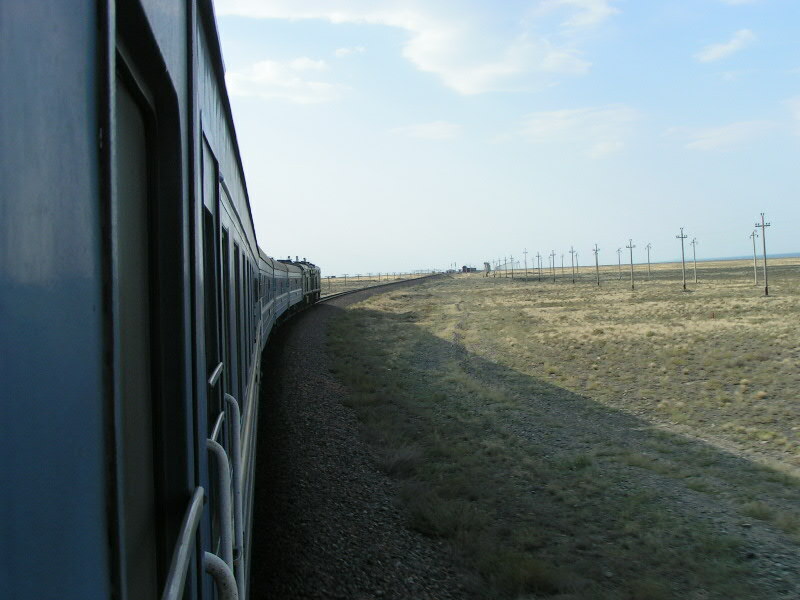 Train 23KH (Alma-Ata 1 - Aktjubinsk) in the Kazakh steppe between Otar and Chu - 3833 kilometers from Moskva. 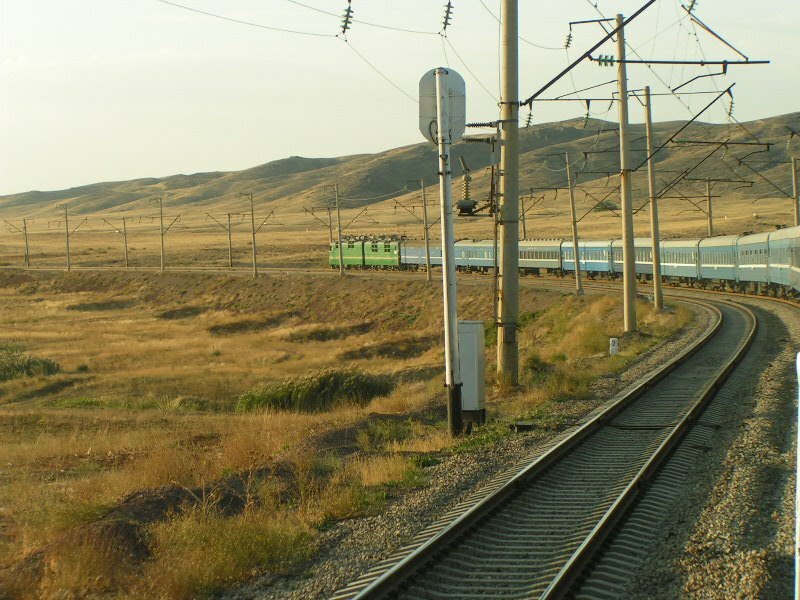 Train 381 (Ufa - Tashkent) between Arys and Chengeldy (Kazakhstan). 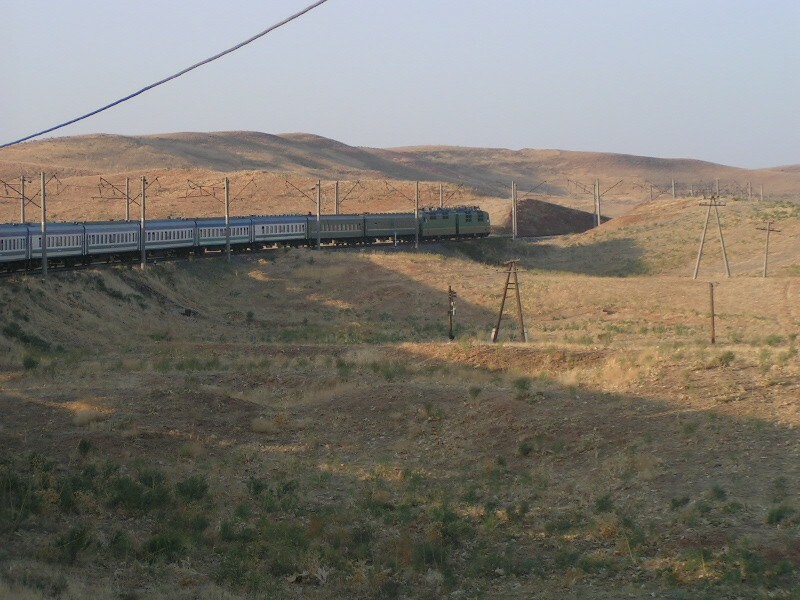 Train 332 (Tashkent - Saratov) somewhere between Bejneu and Makat (Kazakhstan). 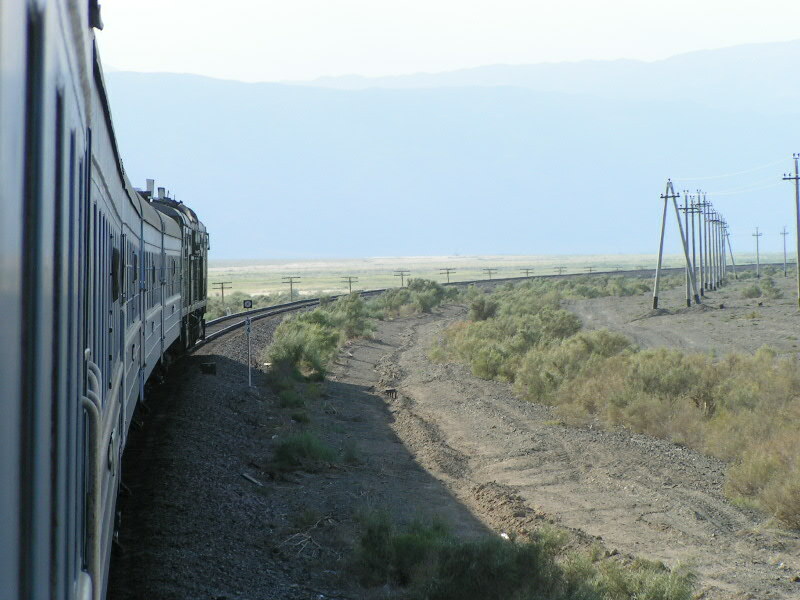 Train 331 (Tashkent - Saratov) between Bejneu and Makat (Kazakhstan). 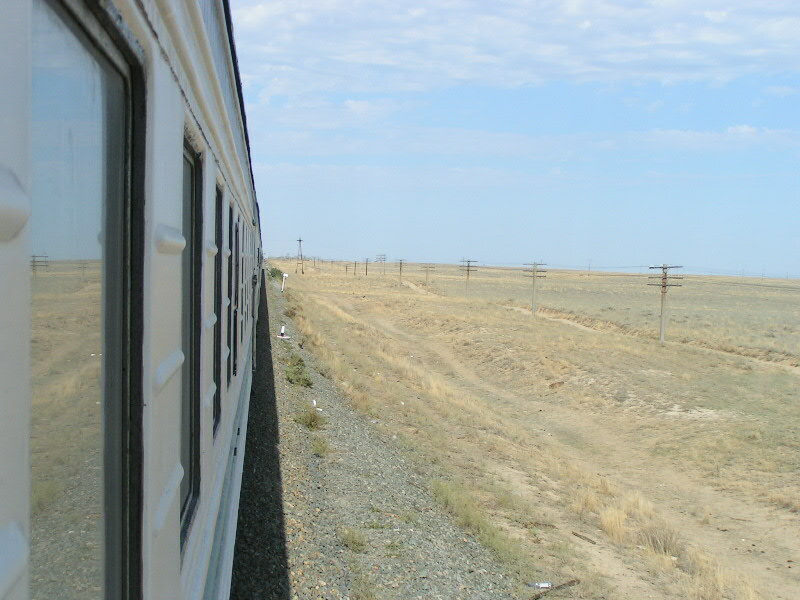 Camel seen from train 331 (Tashkent - Saratov) between Bejneu and Makat (Kazakhstan). 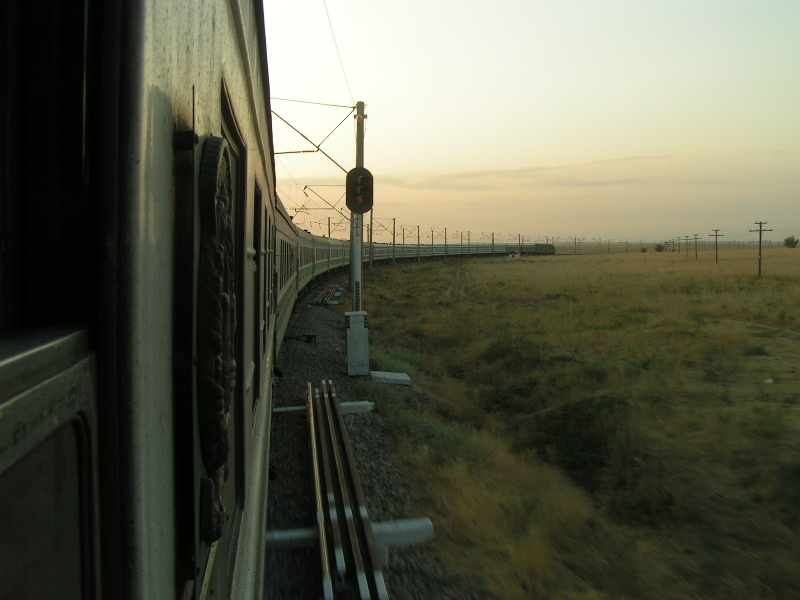 Train 331 (Tashkent - Saratov) somewhere between Bejneu and Makat (Kazakhstan). 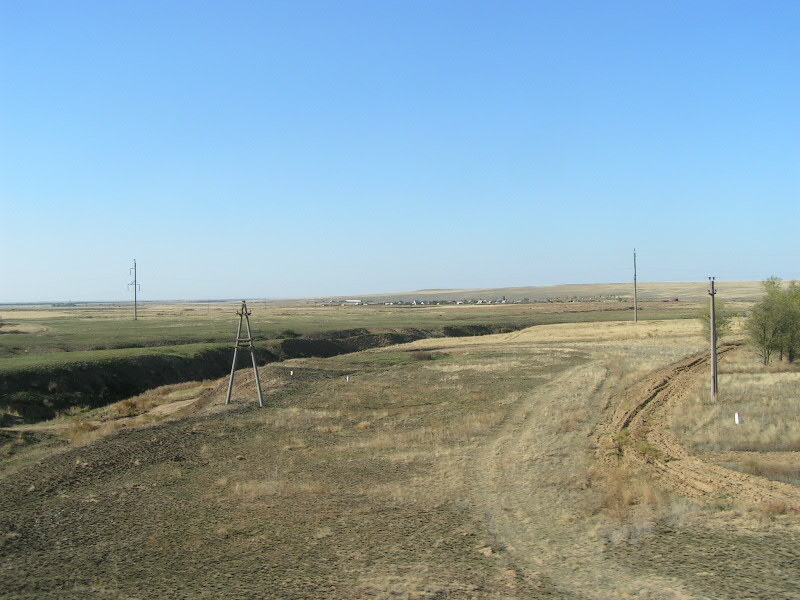 View from train 331 (Tashkent - Saratov) somewhere between Bejneu and Makat (Kazakhstan). 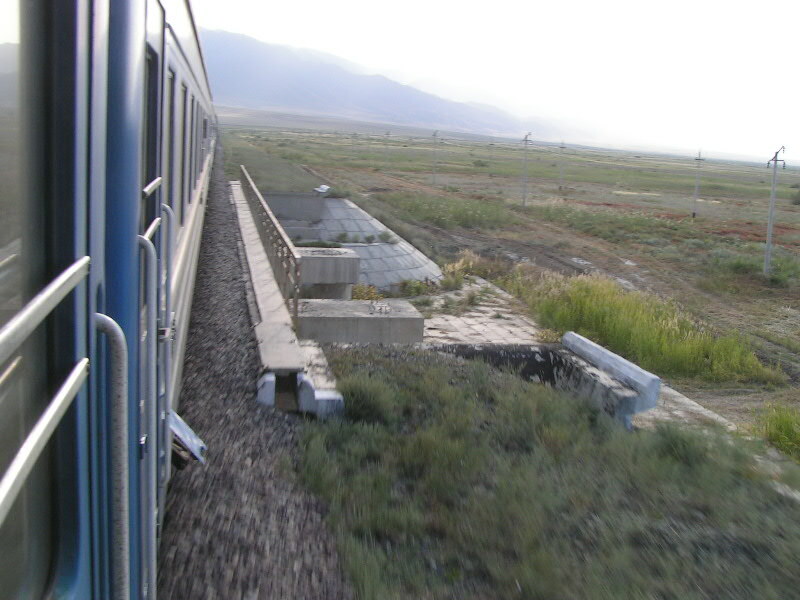 Train 331 (Tashkent - Saratov) somewhere (could be Bekbeke) between Bejneu and Makat (Kazakhstan). 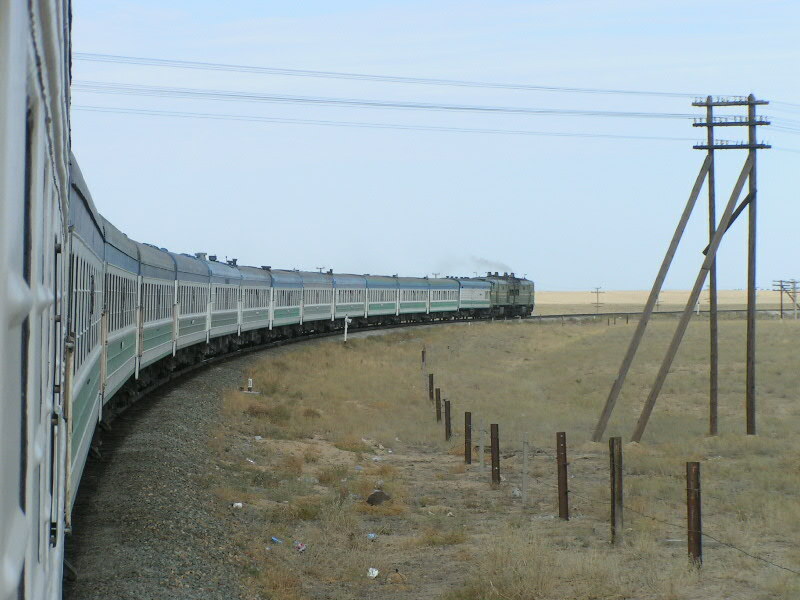 Train 331 (Tashkent - Saratov) approaching Makat. 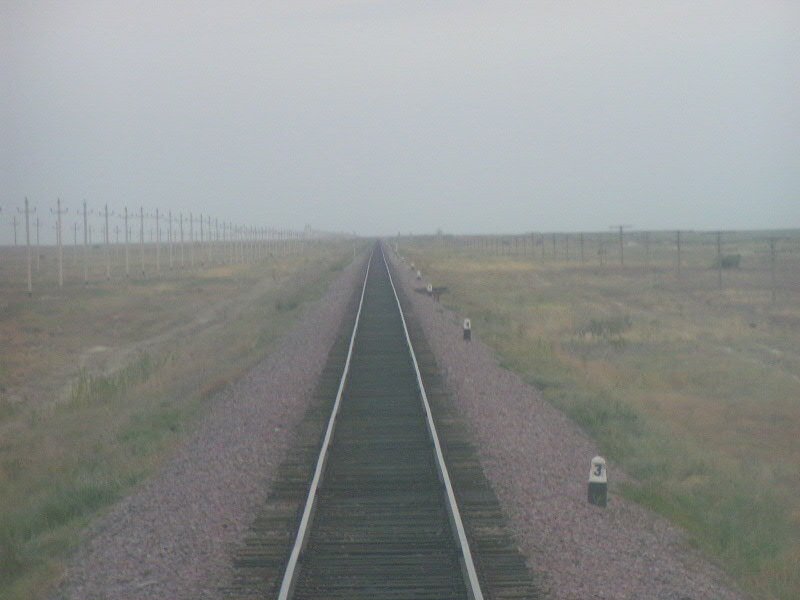 The line seen on the photo is the line to Kandagach, which I used about 8 hours later (after going to Atyrau and back to minimize waiting time from 8 to 2 hours). 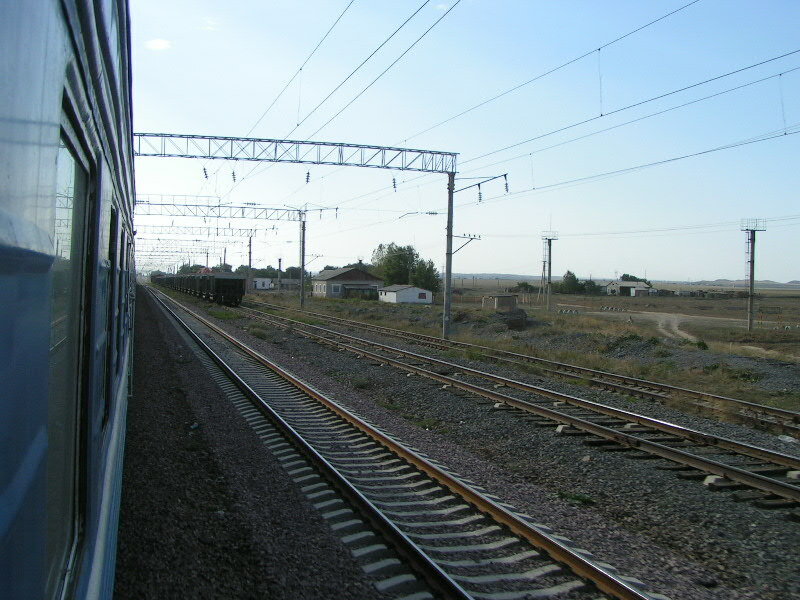 Train 331 (Tashkent - Saratov) approaching Makat. 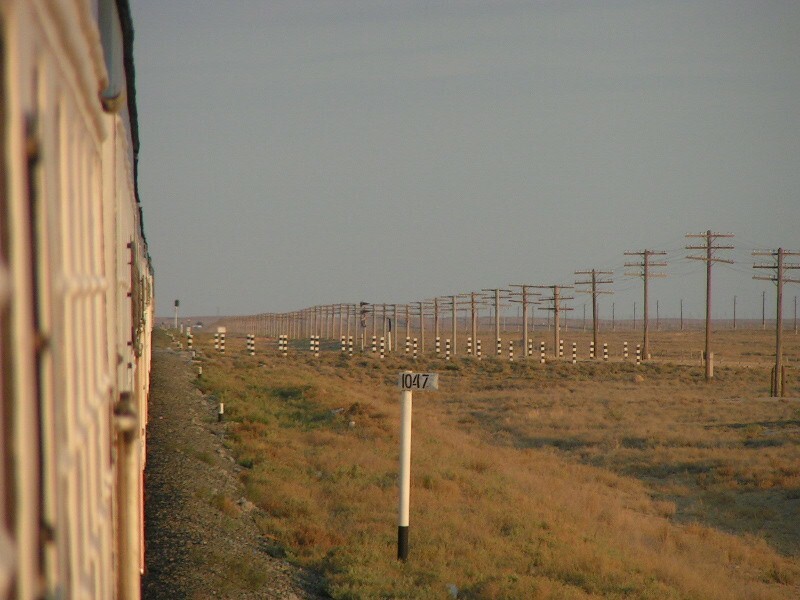 The other track is the line to Kandagach, which I used about 8 hours later (after going to Atyrau and back to minimize waiting time from 8 to 2 hours). 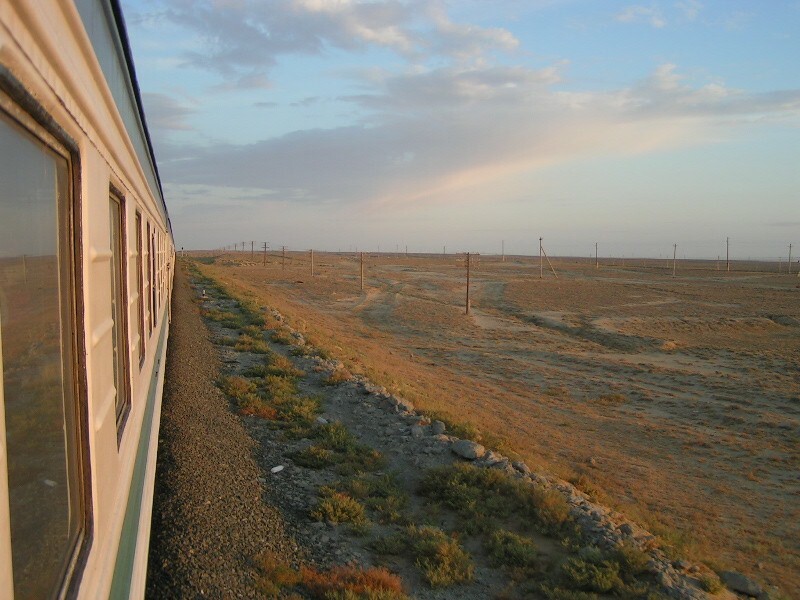 Train 331 (Tashkent - Saratov) somewhere between Makat and Atyrau. 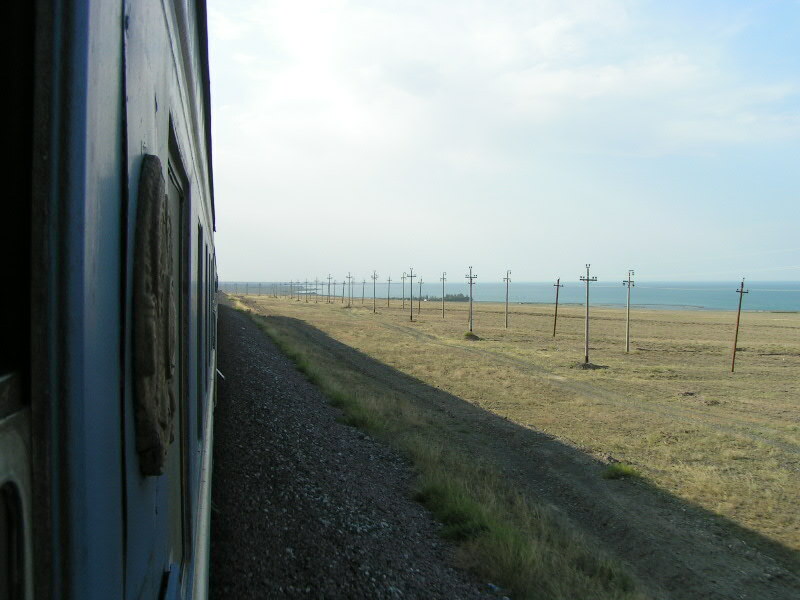 View from train 691 (Atyrau - Aktobe) between Atyrau and Makat (Kazakhstan). 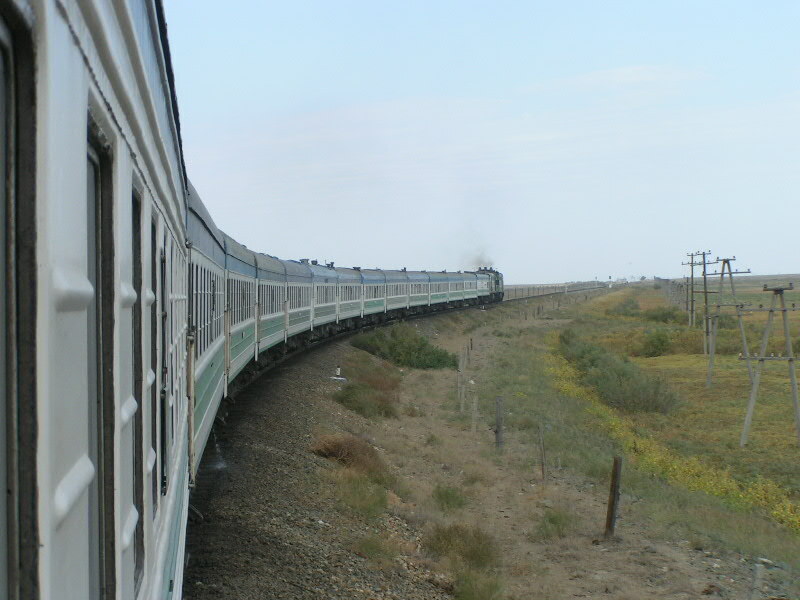 Train 691 (Atyrau - Aktobe) between Kandyagach and Aktobe. 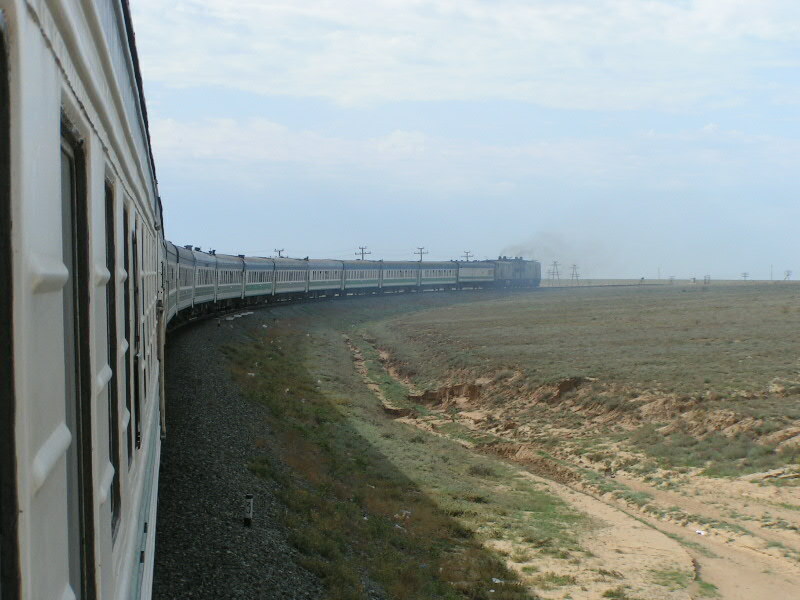 Train 58 (Aktobe - Astana, with through cars from Atyrau to Astana and Kustanaj) between Aktobe and Kandyagach. 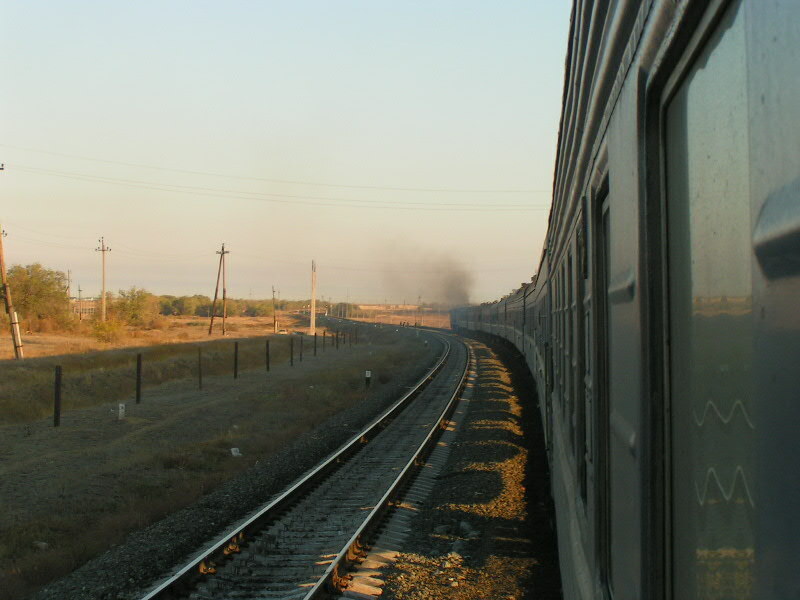 View from train 58 (Aktobe - Astana, with through cars from Atyrau to Astana and Kustanaj) between Kandyagach and Nikeltau. 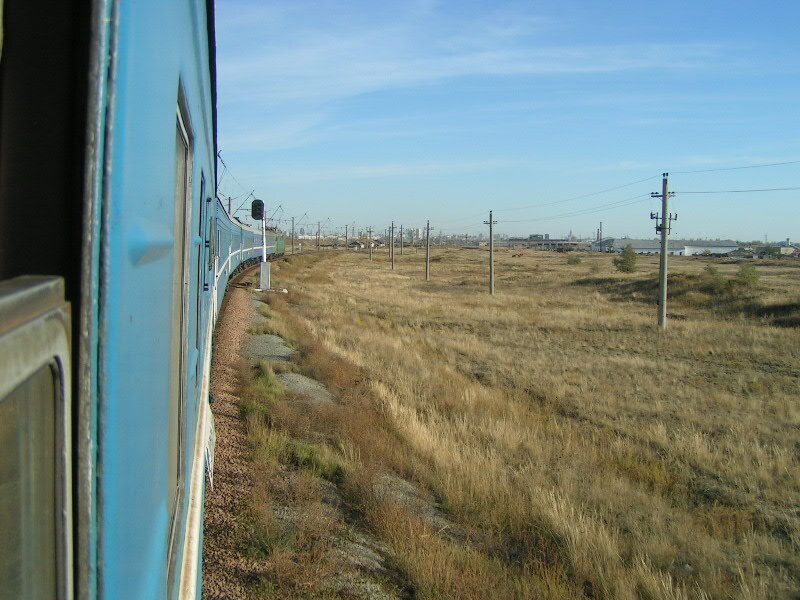 View from train 58 (Aktobe - Astana, with through cars from Atyrau to Astana and Kustanaj) after leaving Nikeltau. 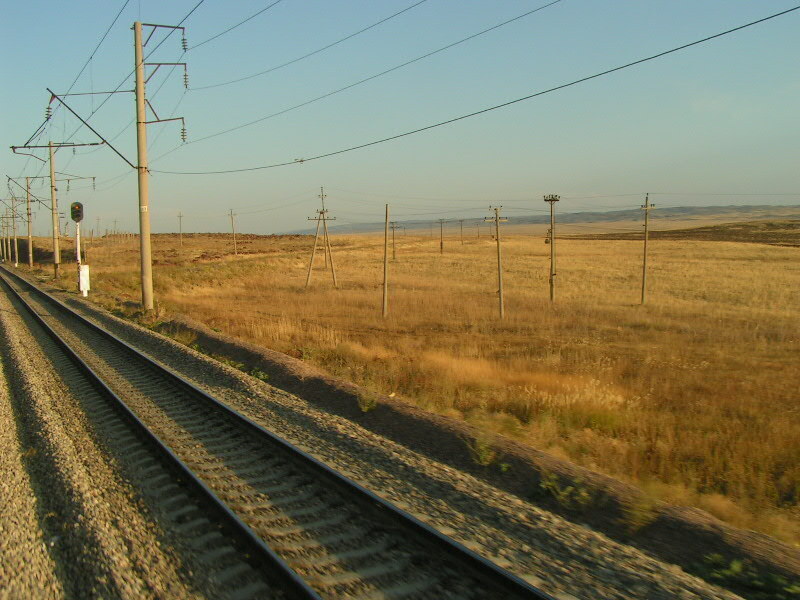 The line on the right is the line from Kandyagach, from where the train came to Nikeltau, where the train changed it's direction. 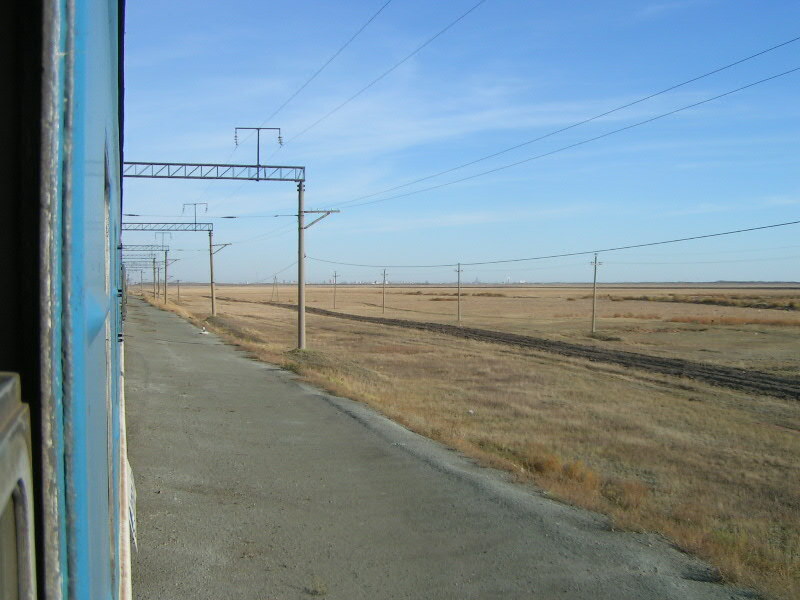 Now the train continues to Chromtau and then runs over a new line (opened in 2004) to Tobol. 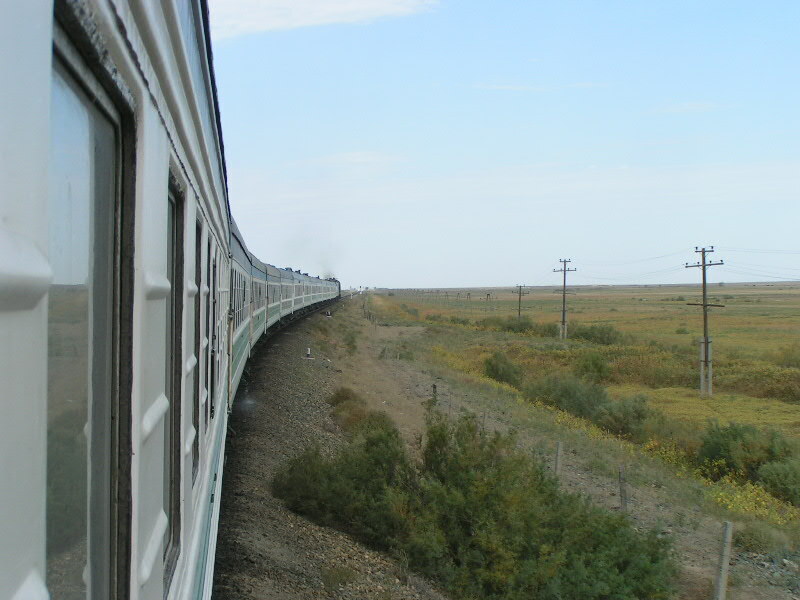 Train 58 (Aktobe - Astana, with through cars from Atyrau to Astana and Kustanaj) approaching Astana - capital in the step. 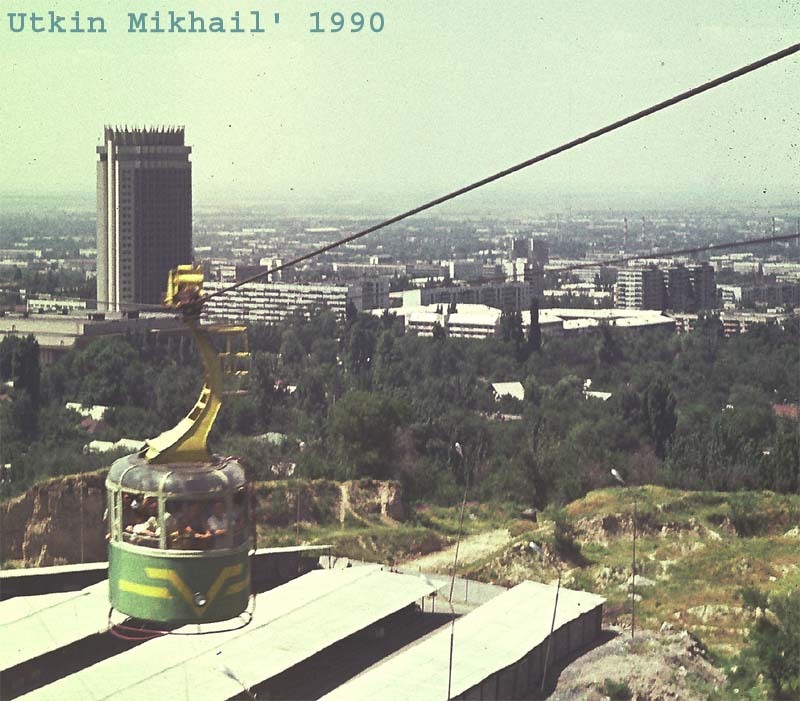 The cable car of urban cable-way from the Dostyk ave. on a Kok-Tobe mountain. Two cars is designed for 25 passenger standing places everyone. 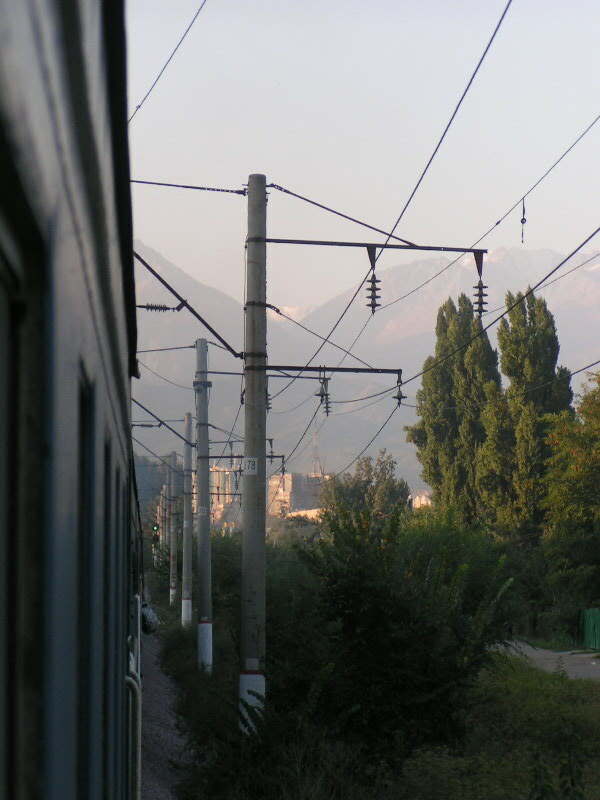 This cable-way is constructed technically qualified persons from Georgia in 1968 and into times USSR entered in structure of Administration of urban electrical transport (trams and trolley buses) in Alma-Ata. Now - separate enterprise. 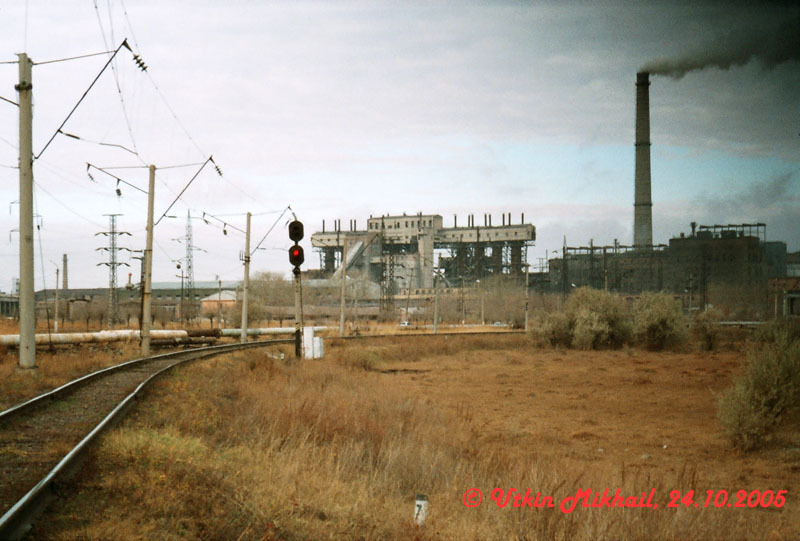 Alma-Ata city, Kazakhstan, August, 1990. In city Ekibastuz of the Pavlodar area the very influential man was found which has taken away at Ekibastuz police my film and has returned it to me. bogat02: Административное здание угольного разреза "Богатырь". 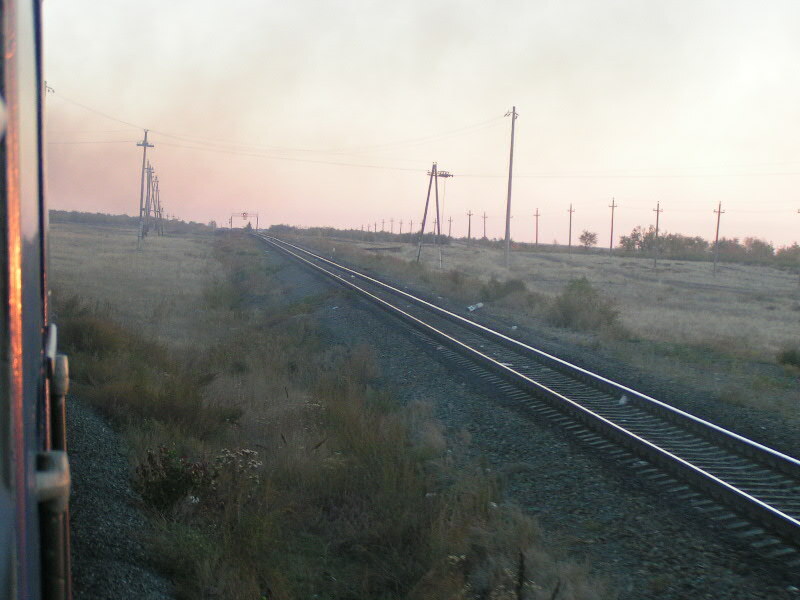 Станция "Богатырская", Экибастуз, Павлодарская область, Казахстан, 8 мая 2005. 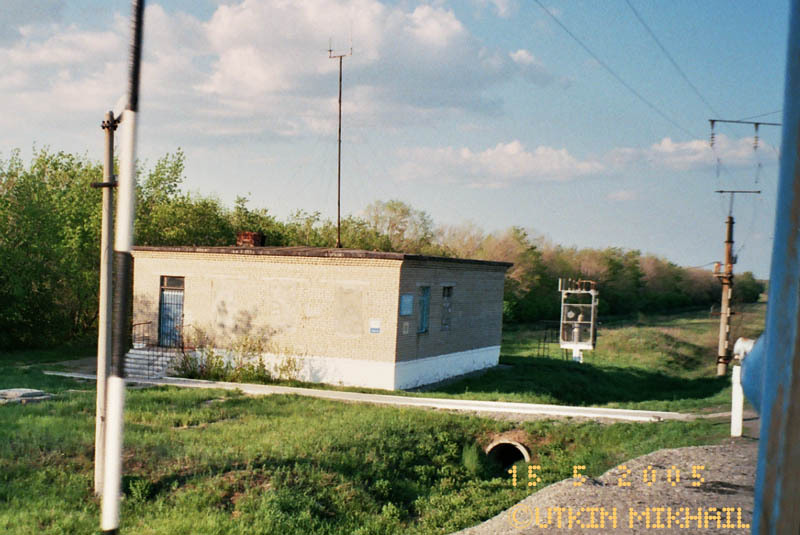 / Office of the administration of coal open-cast mine "Bogatyr". 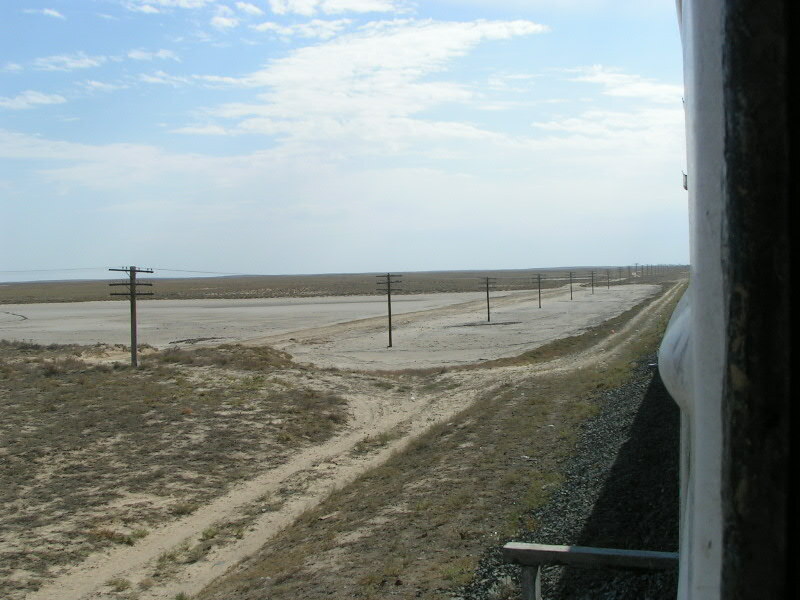 Station "Bogatyrskaya", Ekibastuz, Pavlodar area, Kazakhstan, May 8 2005. 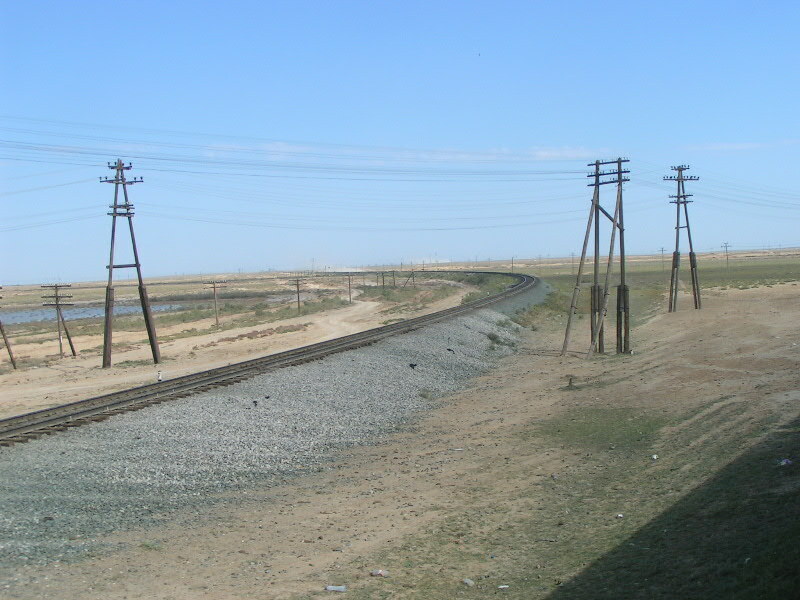 Line of the "Turksib" railroad (Semipalatinsk - Lugovaya) on a site from Chu up to Chokpar, June 17 2004. 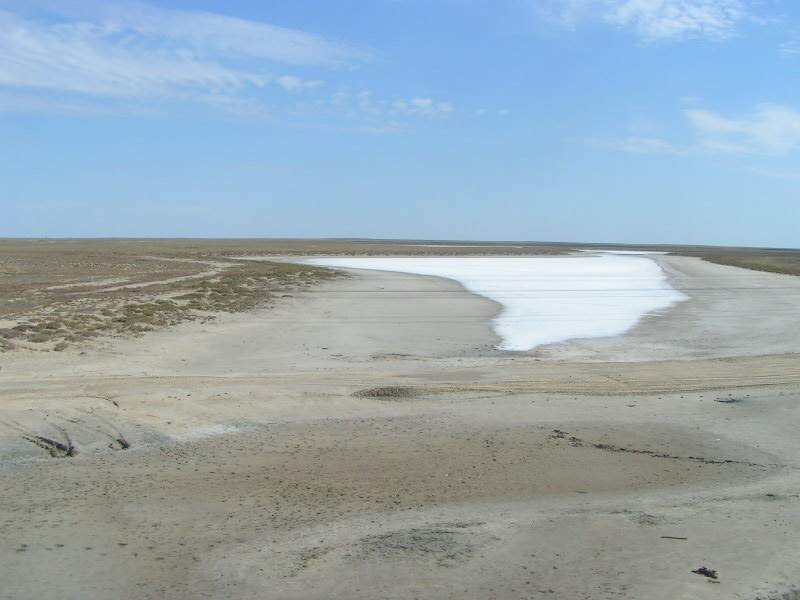 Zhambyl area, Kazakhstan. 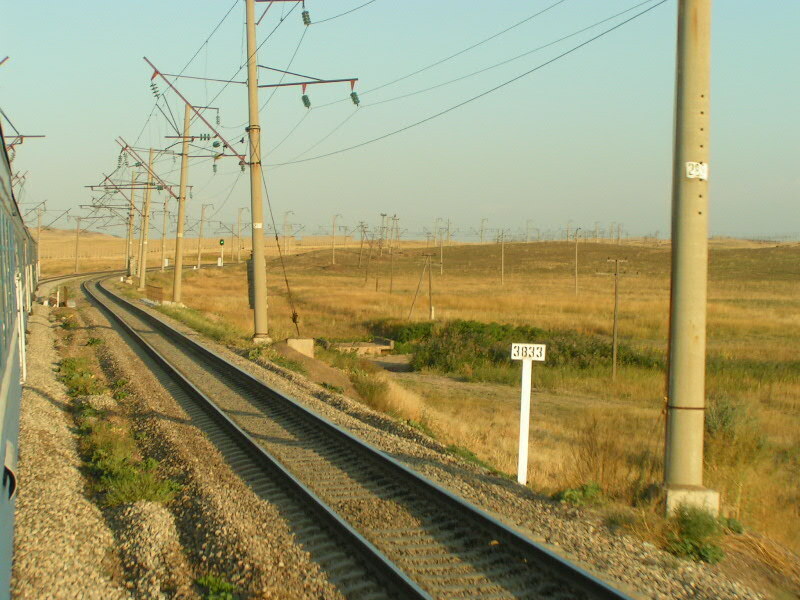 cit-kd: The freight disabled rope-way of unknown purpose, located above a railway distance from Korgasyn to Chimkent. 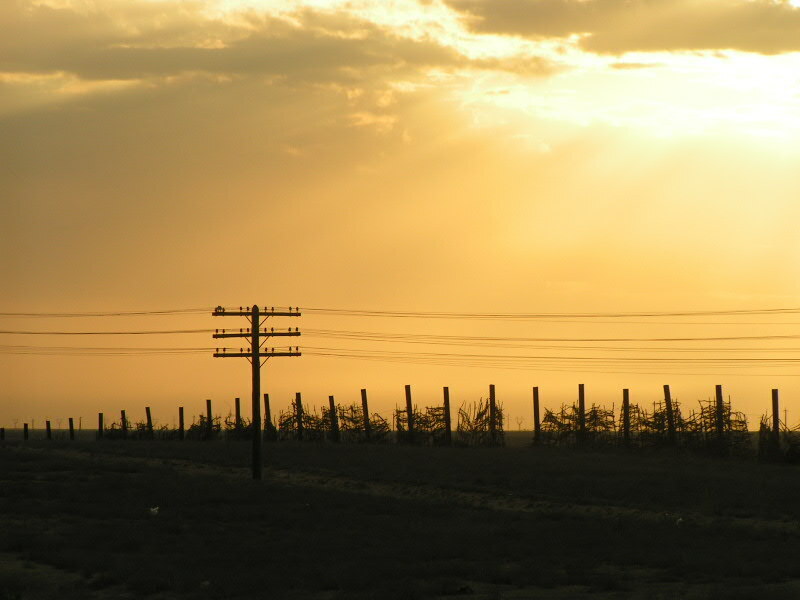 Chimkent city, Kazakhstan. 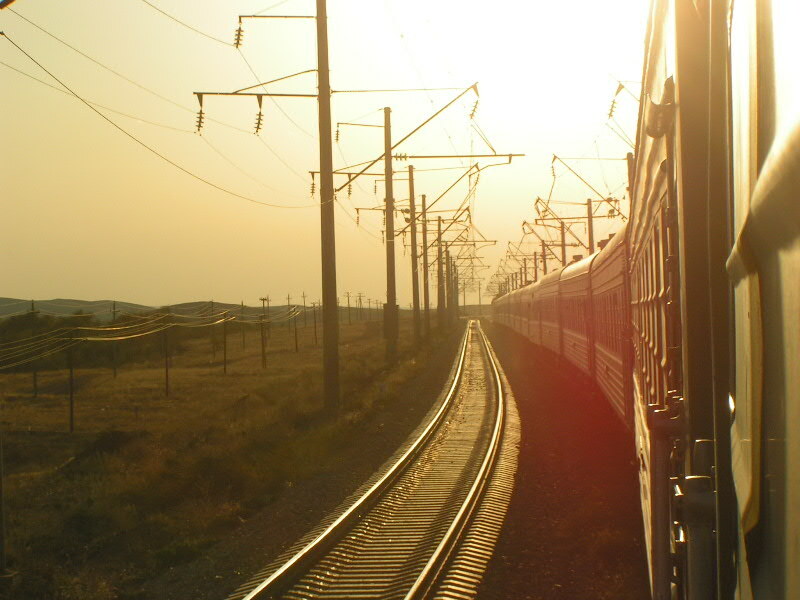 22.02.2006. 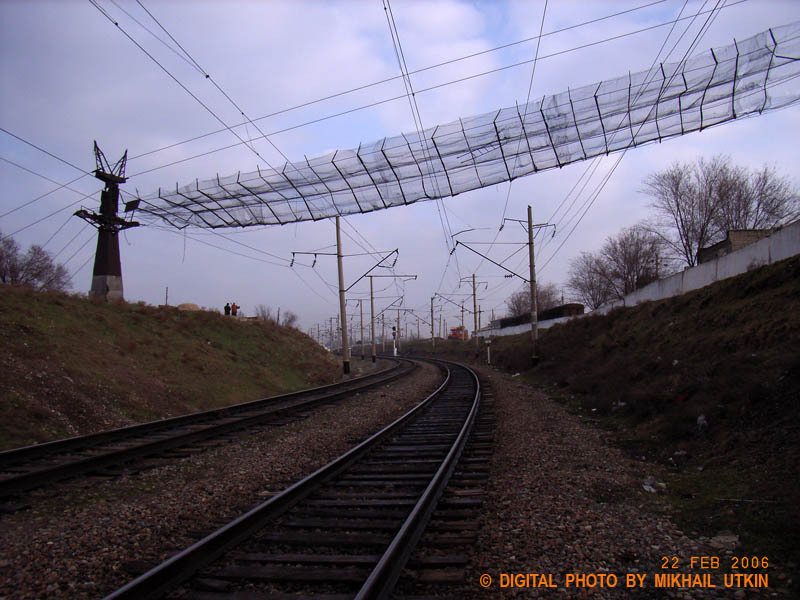 Digital photo by Mikhail Utkin, Utkin@KEGOC.kz. educ: Образцы светофоров и "учебный" кусочек железнодорожного полотна со стрелкой и контактной сетью 25 кВ 50 Гц во дворе Алма-Атинского института инженеров транспорта (АлИИТ). 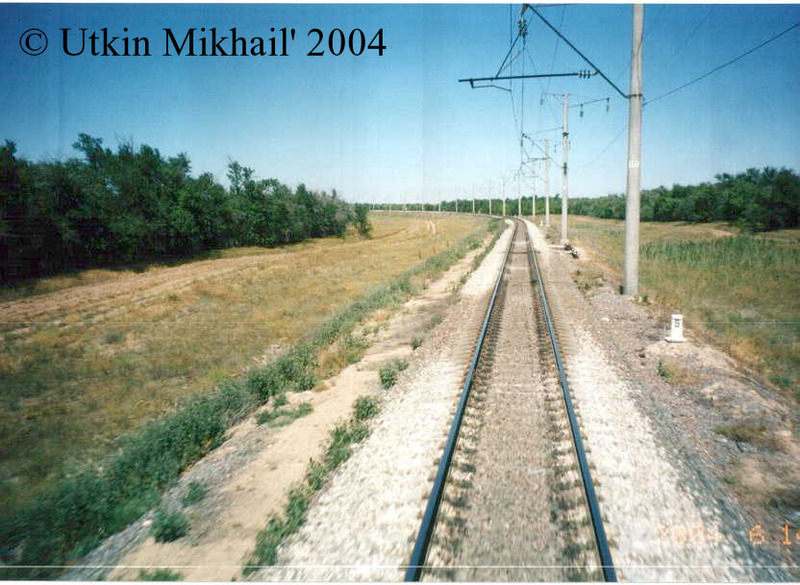 Алма-Ата, угол улиц Масанчи и Шевченко, 19 апреля 2005. 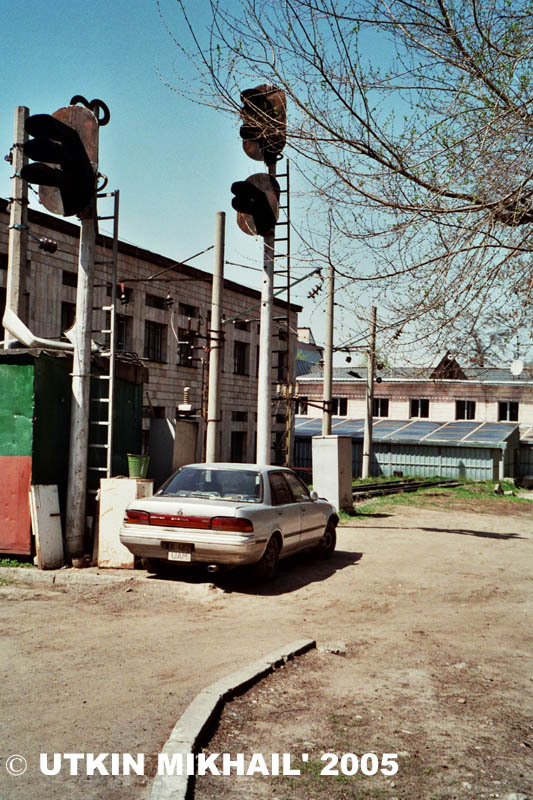 / Samples of traffic lights and "educational" slice railway cloths with an arrow and owerhead wire 25 kV 50 Hz in a court yard The Alma-Ata institute of the engineers of transport. 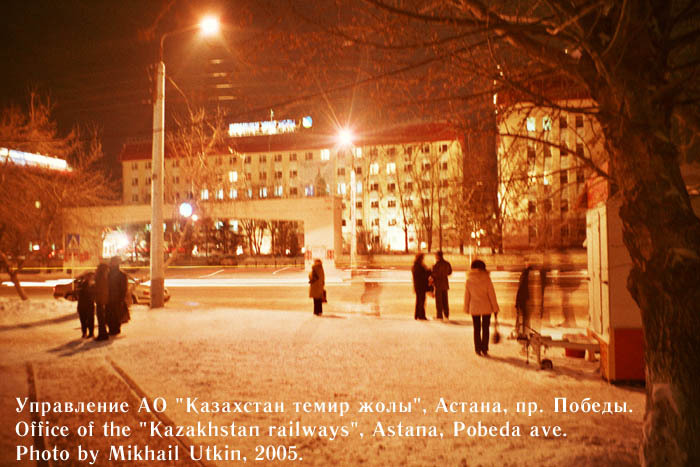 Kazakhstan, Alma-Ata, corner of streets Masanchi and Shevchenko, April 19 2005.
karat: Разъезд Каратомар. 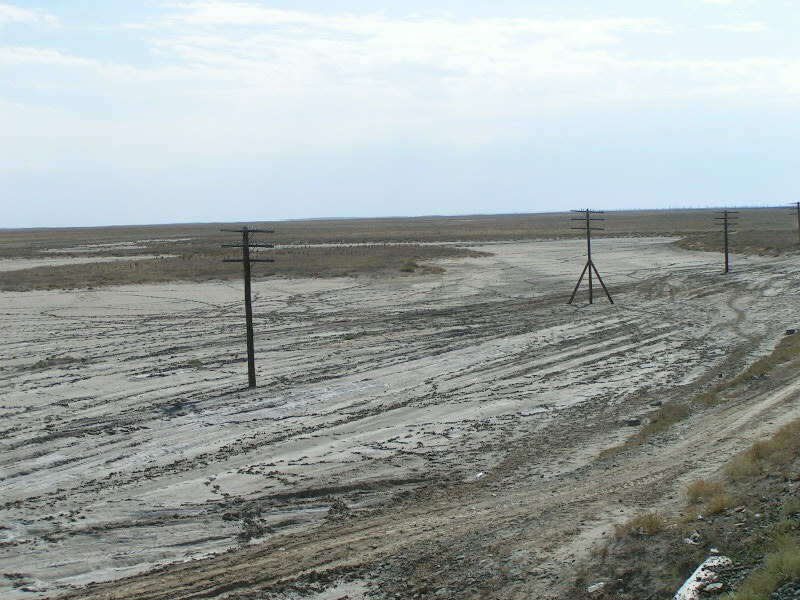 Кустанайская обл., Казахстан, 15 мая 2005. 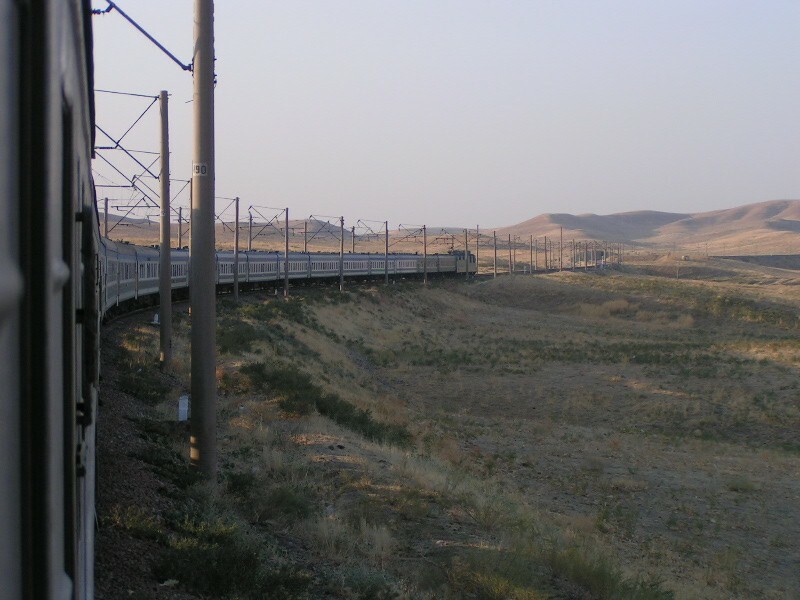 / Railway double-track section Karatomar. 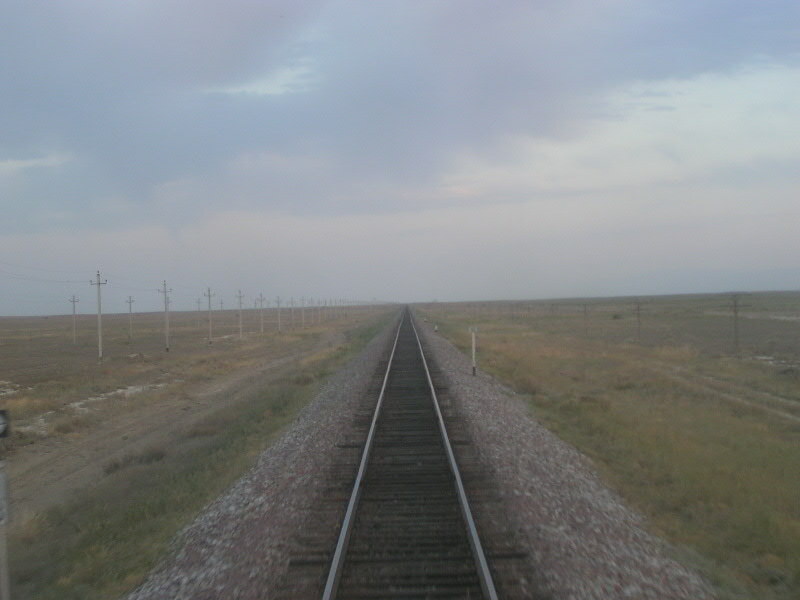 Kazakhstan, Kustanay region, May 15 2005. 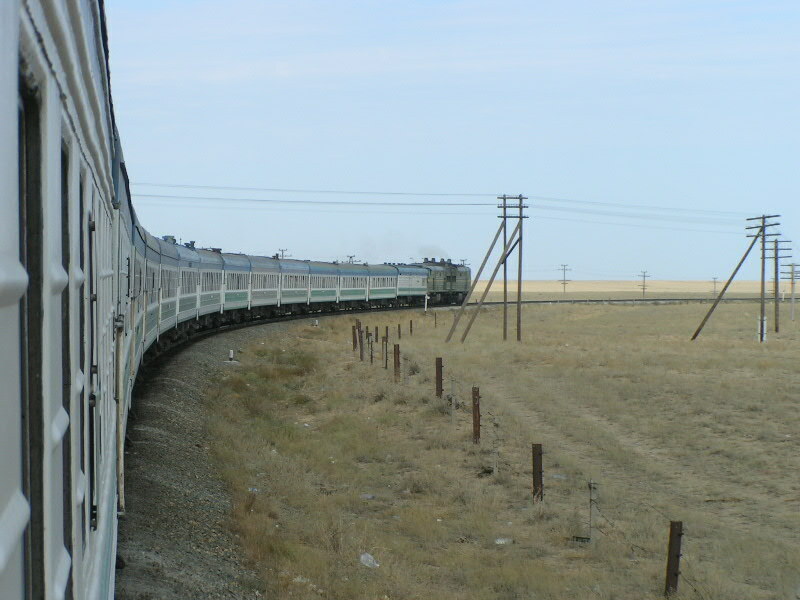 The emblem of the Republican State Enterprise "Kazakstan Temir Zholy" (Kazakhstan Railways). 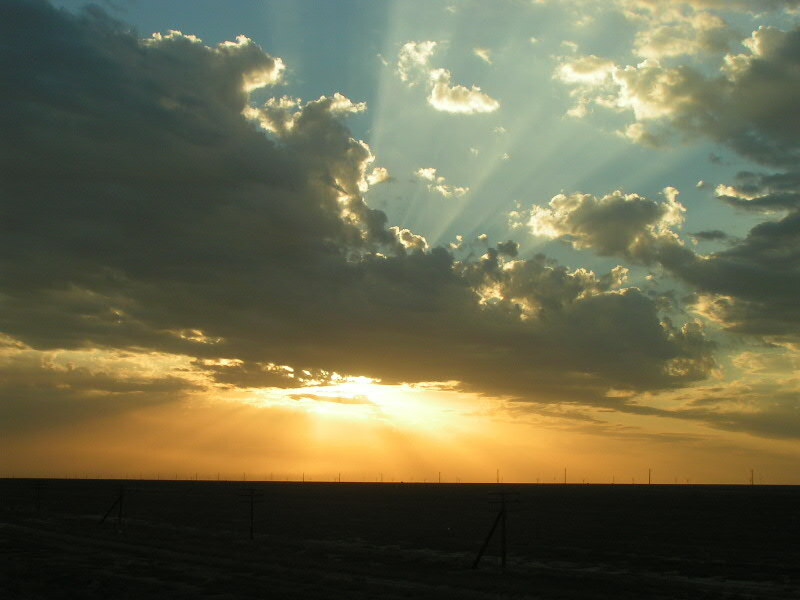 The part of territory of Kazakhstan, to the west of the river Ural, is in Europe. 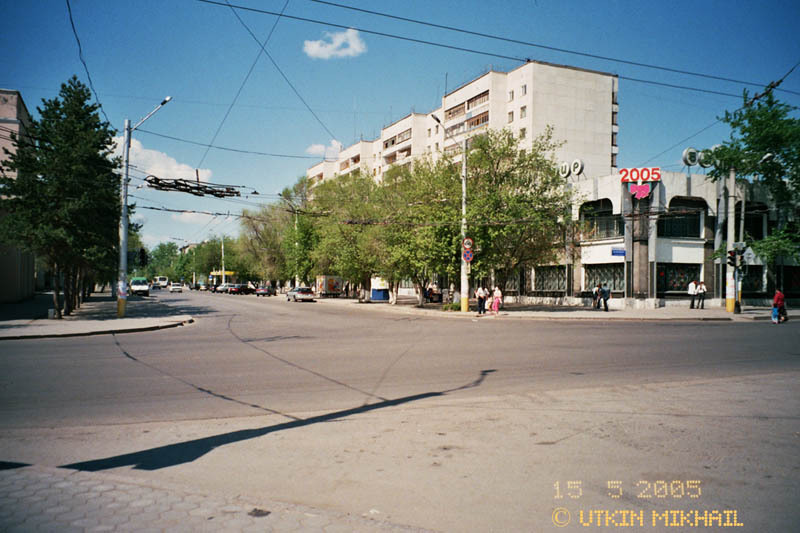 Camera "Zenith - Auto", film "Agfa", photo and scan by Utkin Michael, pechnik@yandex.ru. 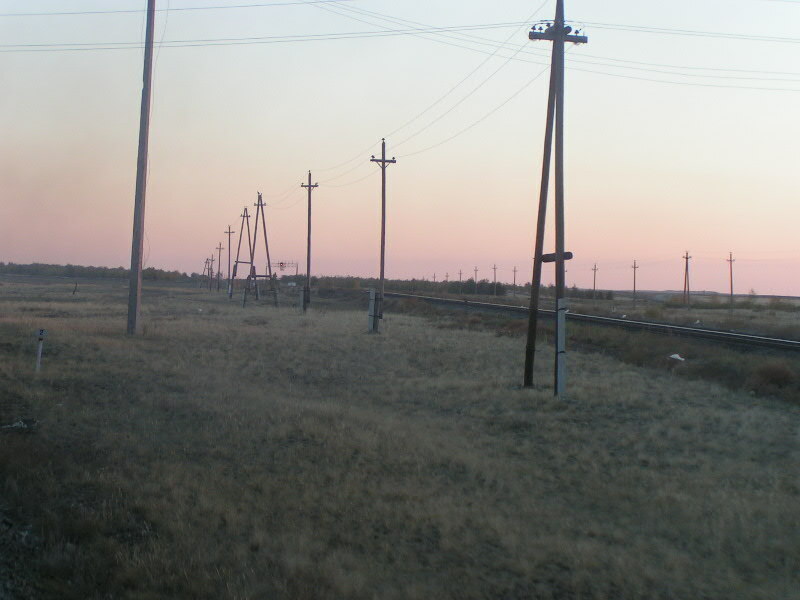 ksn_dt: Троллейбусная контактная сеть в городе абсолютно исправна, но троллейбусы больше не ходят. 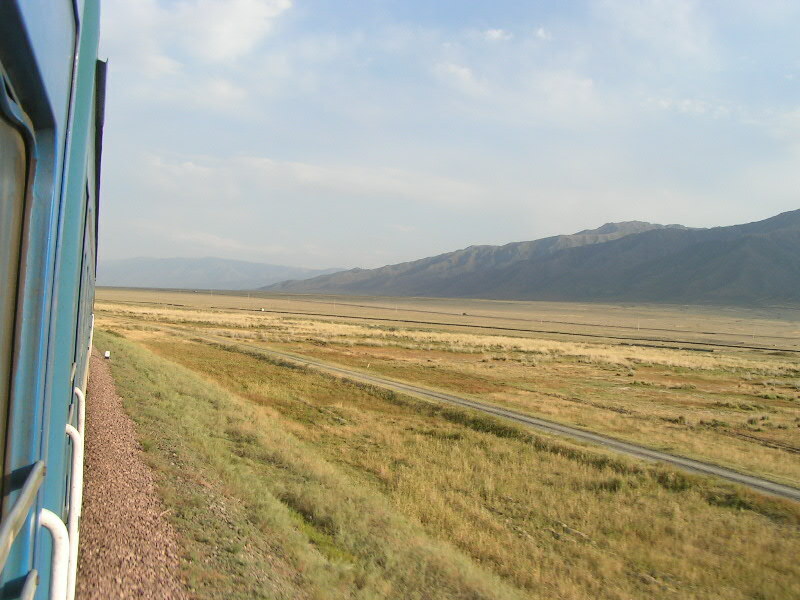 Перекрёсток у Кустанайского драмтеатра, Казахстан, 15 мая 2005. / The owerhead wire for trolley buses is absolutely serviceable, but trolleybuses movement now is not present. 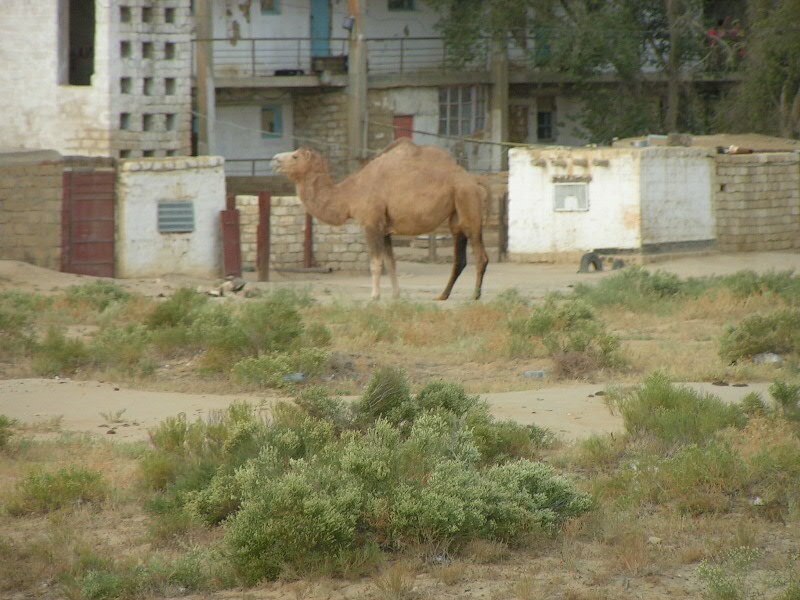 A corner of streets at drama theatre, Kustanay, Kazakhstan, May 15 2005. 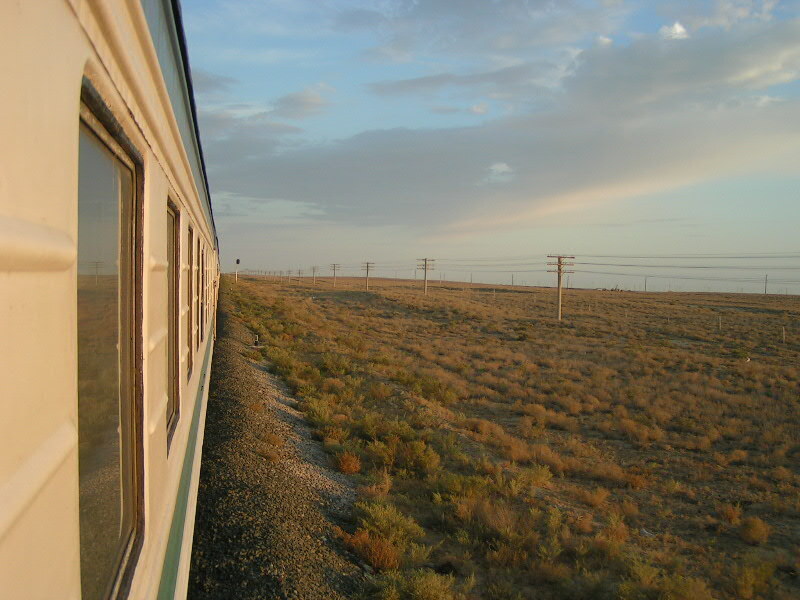 The administration office of the "Kazakhstan railways". 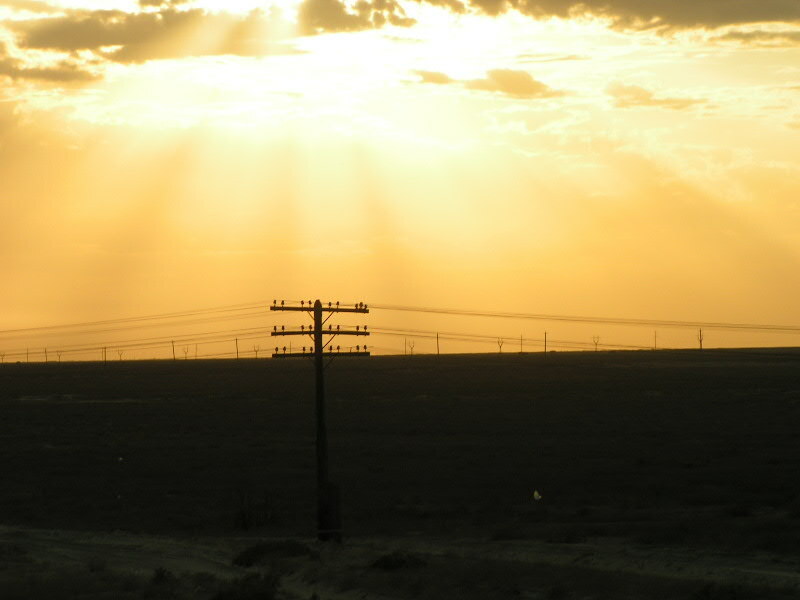 Pobeda ave., Astana, Kazakhstan. 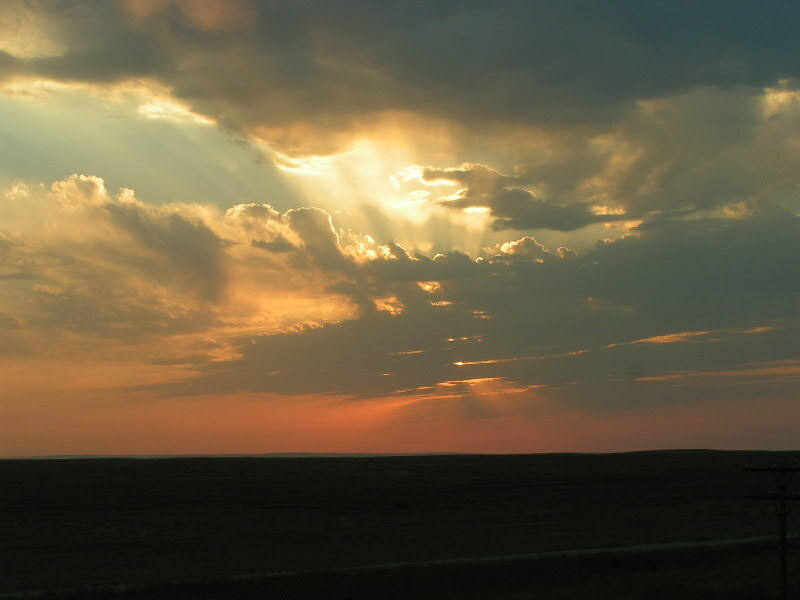 08.1.2005. 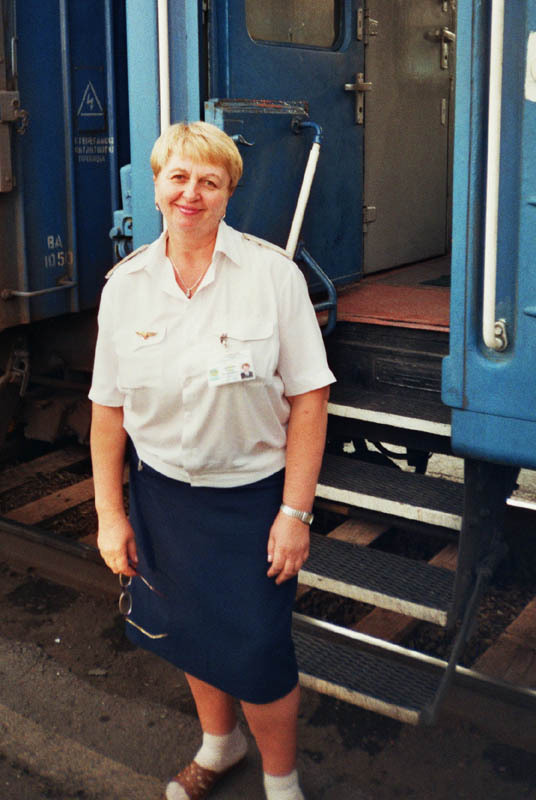 Conductor of the Kazakhstan Railways from carload depot Astana. 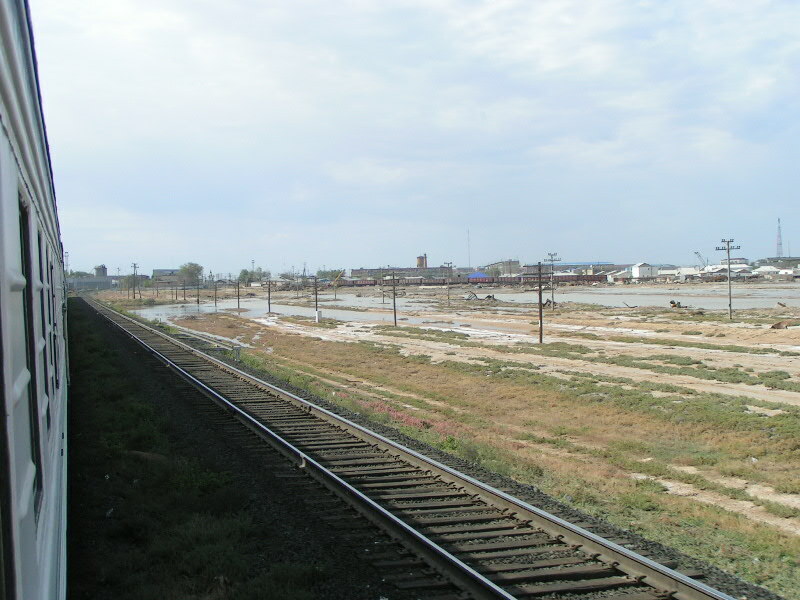 Astana station, Kazakhstan, August, 19 2005.
tem-sv: Входной светофор железнодорожной станции Темиртау. 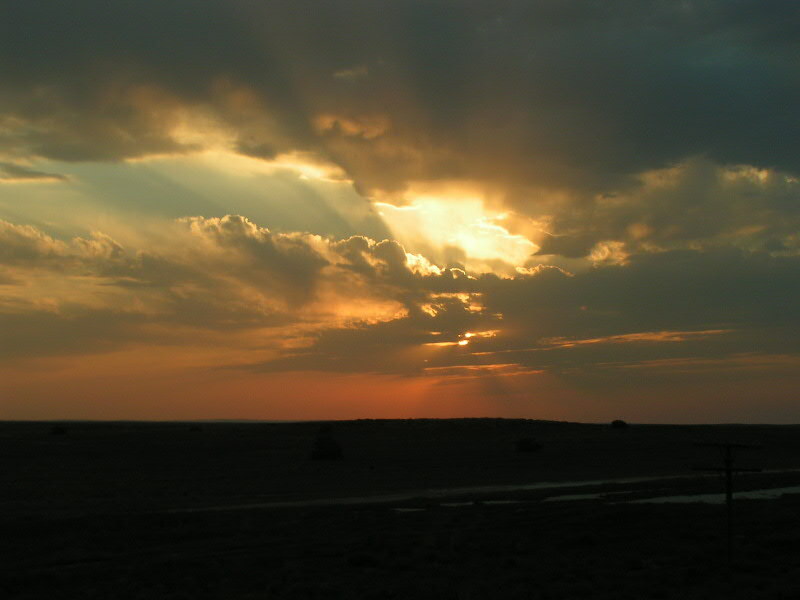 Карагандинская обл., Казахстан. 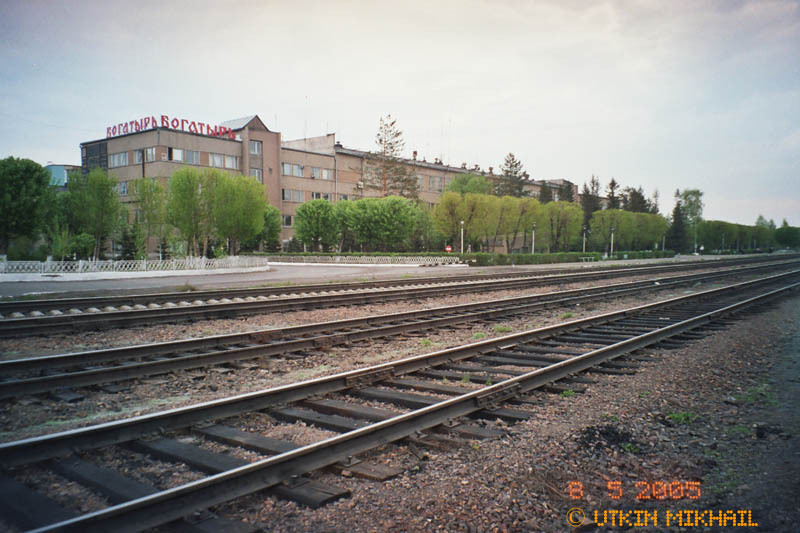 24.10.2005 / Entrance traffic light of railway station Temirtau. 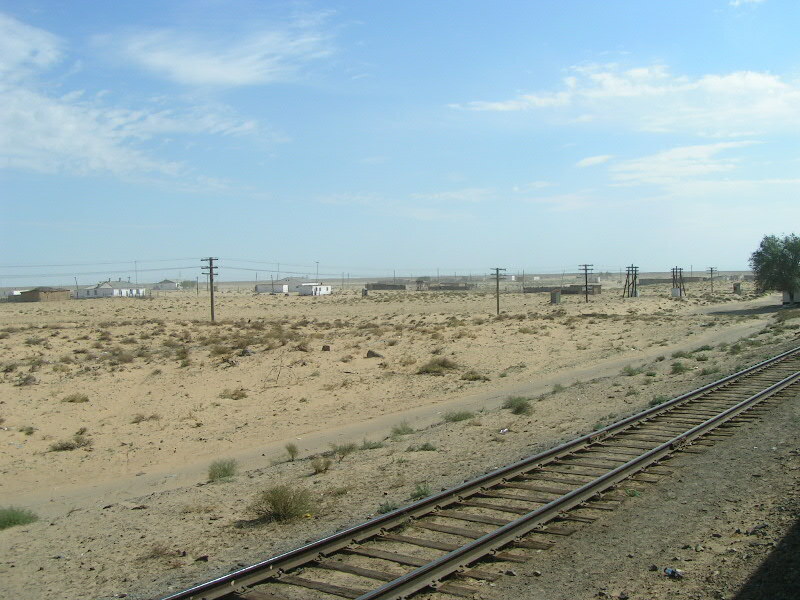 Karaganda province, Kazakhstan. 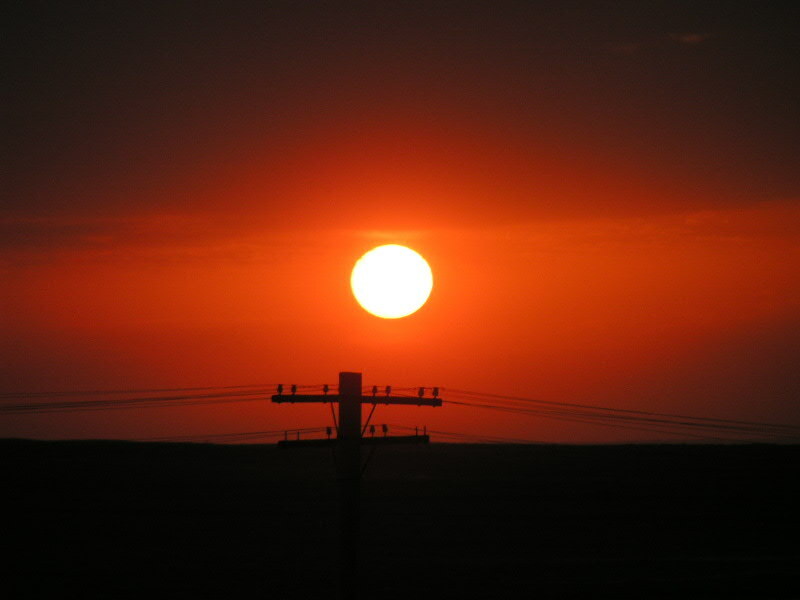 24.10.2005. 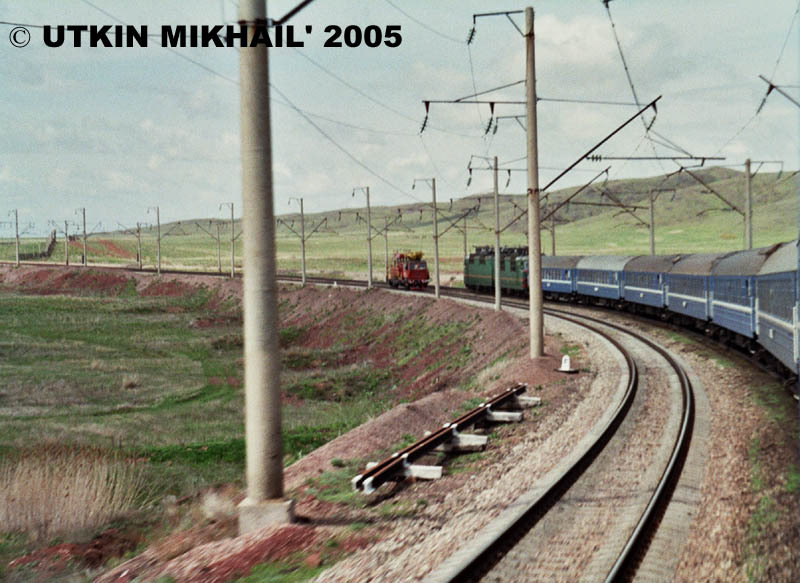 Photo by Mikhail Utkin, Utkin@KEGOC.kz.